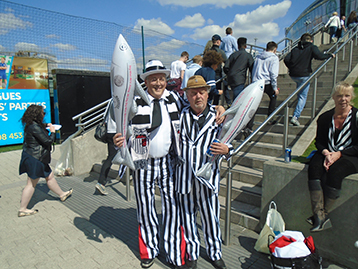 Strictly speaking the Histon Mariners Campaign begun at approximately 17.30 in Wembley on (see previous campaign). 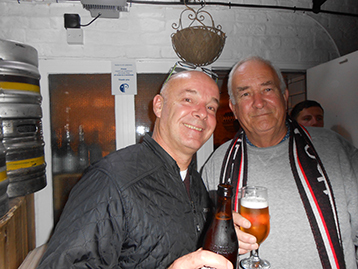 Re-grouping with renewed vigour and optimism following the re-signing of the vast majority of the squad and the fans transfer fund the Histon Mariners were truly on-board. 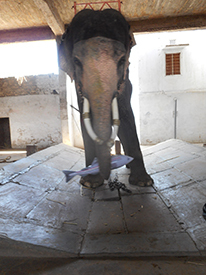 Mattie's previous world-wide efforts have been well documented - the summer of 2015 will be no exception. Beginning in Croatia the usual excitement at his arrival was clear for all to see. 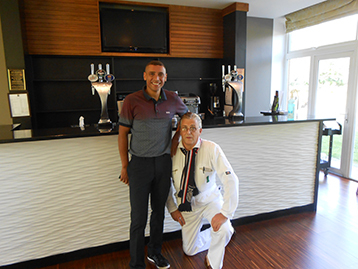 Hotel staff felt privileged to welcome Mattie. Children were clearly excited at Mattie's appearance. 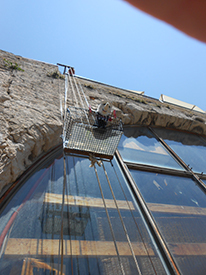 Going to new heights to spread the Campaign brought forth several devoted followers. Representatives of Grimsby, Lake Ontario, Canadian Mariners was keen to make contact. Even French Mariners were delighted to establish campaign links. 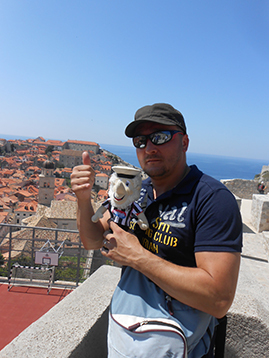 Local Croatian Mariner, aware of Slaven Bilic impending return to English football were grateful for Matties efforts. A highly successful mission confirmed the establishment of the Croatian- Histon Mariners alliance, all sealed with a celebratory fruit juice. 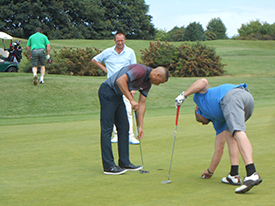 The Histon Mariners were delighted to support the GTFC Golf Day in support of the Youth Academy. 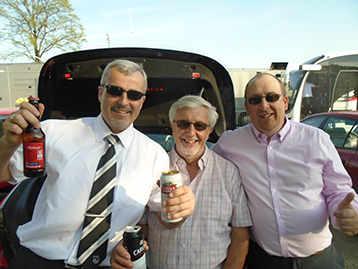 Eventually after Messrs Dickson and Roe arrived after an initial Pie Break Nick, Andrew, Mr Allsop and Mr Wilson posed outside Histon HQ with the well-travelled company vehicle. 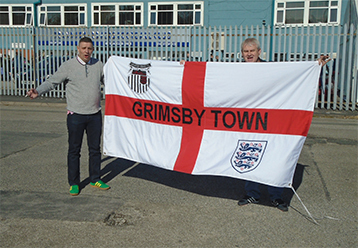 The journey north was fast and direct but for the sponsored pie stops thanks to Shameless Guttering at Grantham and the Full English at the Pride of Lincolnshire courtesy of Tuckers Gutters. 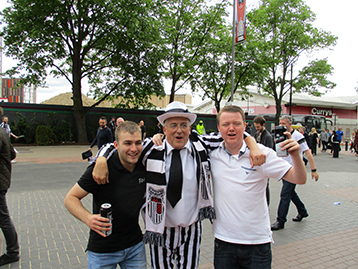 Pre-match preparations at the Royal Humber saw Mr Wilson explain thoroughly his hopes and expectations for the day. 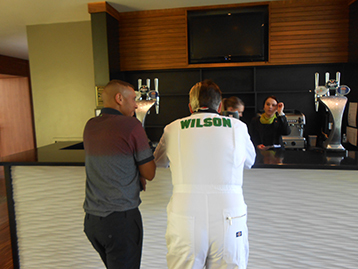 At the first tee the Wilson support team was in full flow. 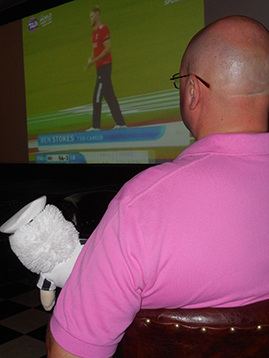 Mr Wilson showed the benefit that a single lifestyle has had on his improved grip and swing. 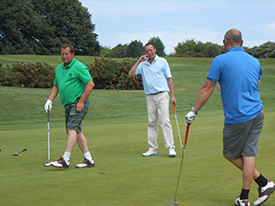 Over the day, crowds flocked to see the Histon Mariners foursome. Mr Wilson waits patiently for Mr. Dickson to finish another pie. Mr Roe surprised everyone with his interest in the local fauna. 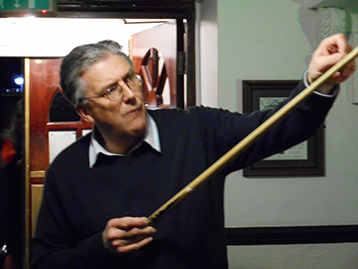 Captain Allsop demonstrated considerable patience whilst coaching his less illustrious partners. Post match analysis was a little subdued given a final rating which was nearer the gutter than the apex. Mr. Wilson was satisfied with the performance of his caddy. Steve Fenty, tournament impresario thanked Mr Wilson for his efforts. 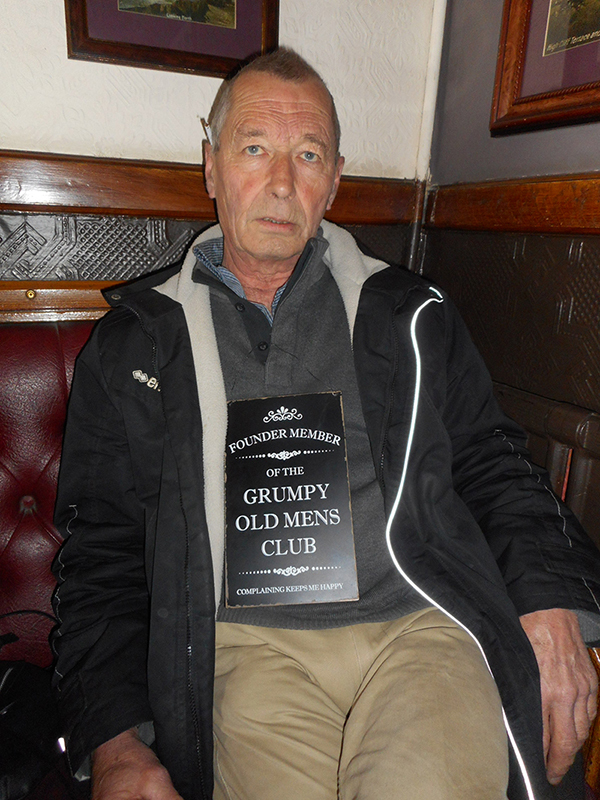 Skipper Allsop looks bemused with the performance of his team. 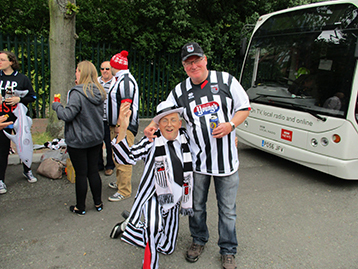 Around Cleethorpes unsurprisingly many locals were ecstatic to welcome the Histon Mariners at the start of the new Season campaign. Julie from the Smugglers welcomed debutant Mr. Dickson. Mr. Wilson met up with old friend Richard. 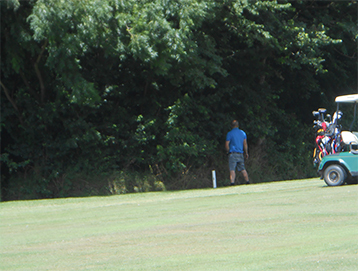 Mr Roe was dumbfounded by Mr. Dickson's tales from the 18th Tee…..!! Messrs Wilson and Allsop were awakened during the same tale. However with further Tales From the Gutter a hasty retreat from the Royal Humber ensued. 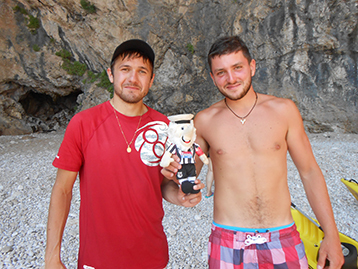 A successful mission which Mr Dickson and Mr Roe feel fully prepared for a renewed assault in 2016. 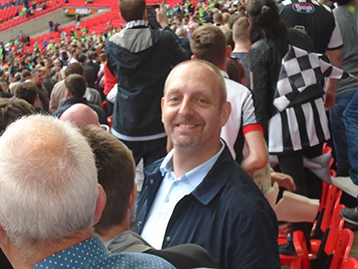 The tremendous excitement immediately prior and maintained through the early fixtures has been muted for the Histon Mariners who have to report the death of West Midlands Recruitment Officer Bob Hine. 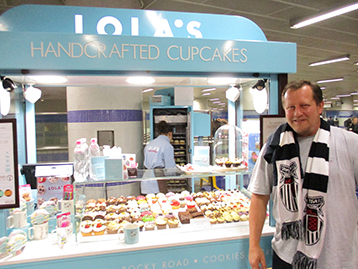 Bob's brief association with the Mariners brought him considerable happiness and he will be missed. A beautiful sunny day at Cleethorpes provided the perfect backdrop for the outset of the Histon Mariners 2015-16 Campaign. 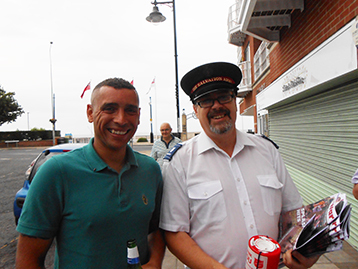 Mr. Bateman, Chairman of the Wainfleet Mariners was first on parade at Cleethorpes operational HQ. 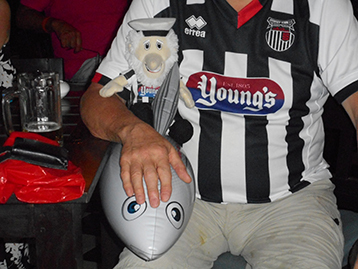 At Willys, Stuart was keen to meet up and brief (bore) long time associate of the Histon Mariners, Bill. Stuart's routine is now fairly established with a quick visit to 'ladies outfitters' to meet with Tina. After discussion about 'stock' and 'shop layout(!) Stuart is now well-known to proceed to Blundell for his afternoon nap. After an explosive start - 2 goals in 5 minutes - it was always inevitable that most of the game would be played in a lower gear. However two 4 v 1 victories at home (2014 a 0 v 0 and 0 v 1 !) provide a great basis on which to build and hopefully establish Fortress Blundel. Without a doubt town look solid and committed. Pre season additions to the squad look to have blended quickly and strengthened. Without doubt there looks like, more goals will be forthcoming. 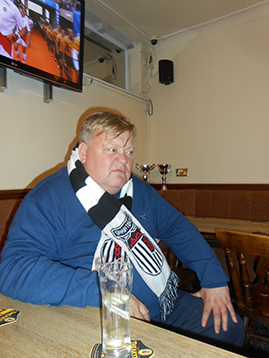 Post match analysis naturally took place at the New Imperial Club, where barmaid Linda gave particular attention to Stuarts post match Diet Coke (with ice, lemon and a straw). 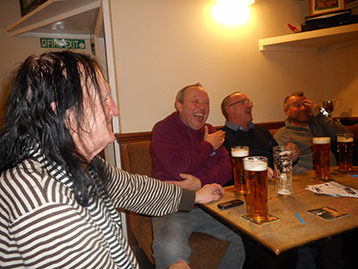 At a new venue for the Histon Mariners, the Kingsway Liberal Club provided most convivial surroundings and I am sure the Logistics Director will soon introduce the President/Chairman et al. 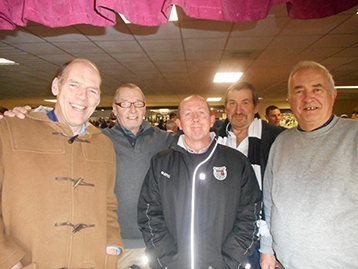 Then the Charles Kennedy Centre, Kingsway Club, New Imperial Stalwarts Richie and Wayne were keen to show their appreciation of the work done by the Histon Mariners during the close season. 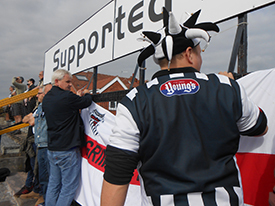 The appreciative response of Town fans was to continue at the Smugglers where Cleethorpes local Howard Thornton sought out Imperial Wayne and provided further evidence of the immense optimism around Cleethorpes. 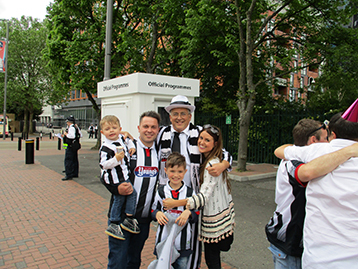 800+ Mariners marched on Altrincham creating the now familiar buzz. Luke, Mike, Lisa and ? were as ever buoyant. From this point onwards things generally went downhill. No pies available. 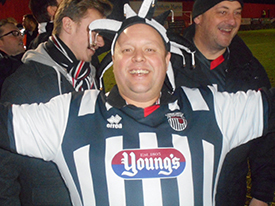 Who ate all the pies? Highlight - an equalizer by the ever improving Omar B. 10 minutes after half time when normal service appeared restored. 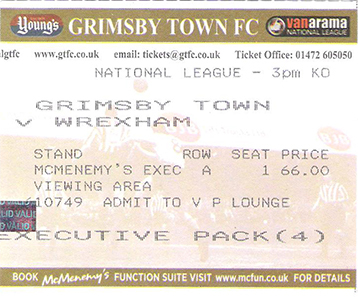 A James McKeown error, gifting Altrincham a goal, after which Town were at the races. HM Man of the Match? A six hour journey home to Histon - roadworks, diversion, roadworks, diversion etc. etc. Does James McKeown need someone breathing down his neck, in order to revitalise the leagues best keeper? The defence needs an organiser - Shaun and Gregor. 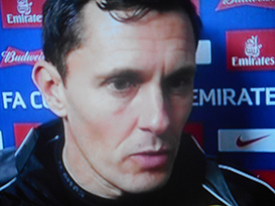 The reputation of Paul Hurst's Black and White Army is legendary. Everywhere the ground troops are observed with both reverence and a degree of wariness. 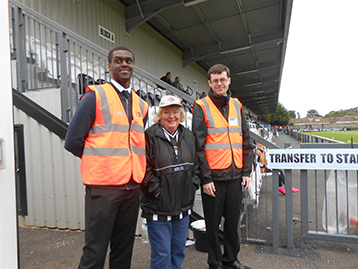 At Borehamwood the match stewards were clearly well briefed in advance, as they checked out a very bemused elderly lady. A great result with Man of the Match Nathan Arnold appearing as committed and prepared as opposed to his stuttering start last year. 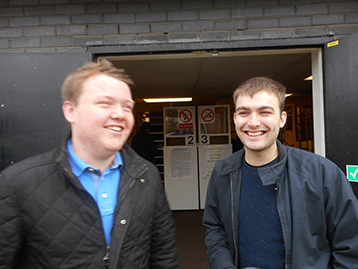 Great to see a smiling James McKeown who is beginning to look settled after his greatly disturbed pre-season. The leagues best keeper continues to improve and looked more confident in his own domain. The confidence that spreads amongst the defence as a result is also reappearing. Clean sheets to be restored shortly. 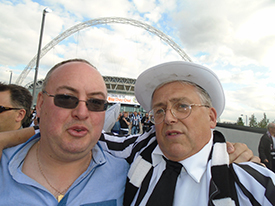 Wayne & Pedro Pete of the Black and White Army continue to march 'en masse' contemplating and analysing the relentless march forward. A few members appear to prefer 'solo contemplation'. Geordie Gaz, professes to have mates but occasionally prefers his own thoughts. Probably a fair result - soft penalty, late equalizer courtesy of the lethal Padraig Amound suggests the never say die attitude will bear more fruit over the season ahead. 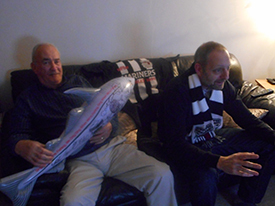 The first full-scale match day manoeuvres of the Histon Mariners this season. 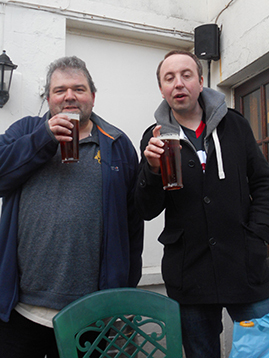 The well-trodden routine saw establishing base at the redoubtable Kingsway, the customary pre-match analysis at Willys. 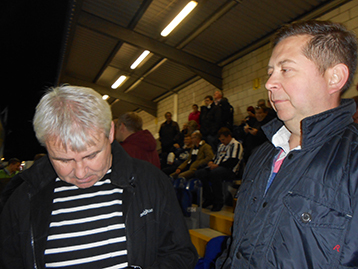 The President listens intently whilst the Chairman realises the extent of the Deans plans. The Chairman looks worried and confused. The President sets an example to us all as he fully embraces the Dean's plan. As the seasons campaign gathers momentum the Dean is clearly anxious to get total commitment to his fitness and restoration projects. So intent was the Dean to widen his programme, he took the unorthodox step of checking on other guests of the hotel in their own rooms. Any further developments in this new approach will be duly recorded. 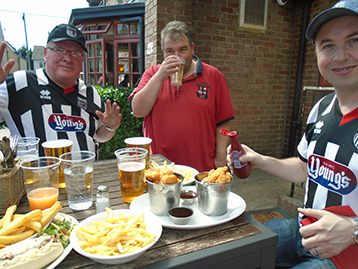 At the Notts a more orthodox approach saw the Dean briefing the hierarchy of the Histon Mariners over a pre-match snack and juice. Whilst the President appears to embrace the Chairman continues to look confused. 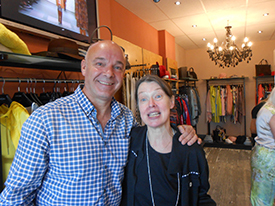 Fully on board the Histon Mariners leadership is welcomed by Stuart Bateman, confidant Tina, his favourite female clothes shop, owner of "Think Bubbles". 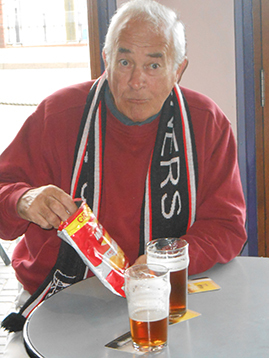 The usual welcome afforded the Histon Mariners continued at Blundell. 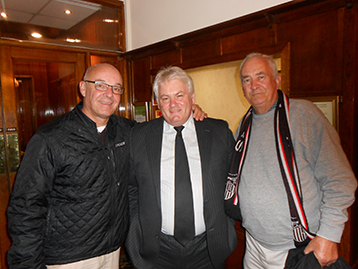 The President and Chairman were thanked by legends Dave Boylen and Jimmy Lumley for their leadership of the Histon Mariners. At the same time news of the Dean's campaign had spread rapidly. Injured town stars Scott Brown & Padraig Amond were ancious to consult with the Dean. 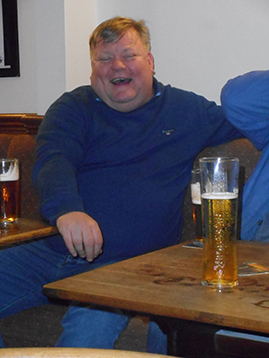 Chesterfield Mariner Paul 'Lord Badminton' came to discuss his injury sustained whilst beating a County U19 player. Again probably a fair result. Had we have taken our chances victory was there to be taken. The Mighty Mariners are very close to being a very good team. The strength off the bench is awesome for this league. A bit of luck, a bit of confidence and real sustainable progress is likely. Man of the Match Craig Clay with Josh Gowling close. Whilst concentration at this time has been on the Dean's programme, the continuing youth development programme should not be ignored. 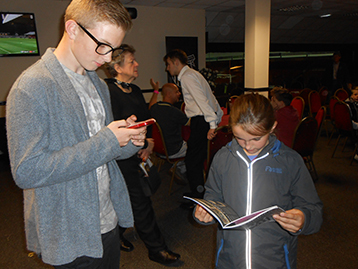 Here young Sophie can be seen studying teams news & statistics, whilst a now ageing teenager, John Boy, checks his phone.....!!! The following morning saw the Chairman embrace the Dean's fitness plans with an invigorating early morning walk. Clearly looking for inspiration (or any mates?) the effect on the Chairman’s future plans should be interesting. Immediately on arrival Mariners everywhere were keen to welcome and thank the Histon Mariners. 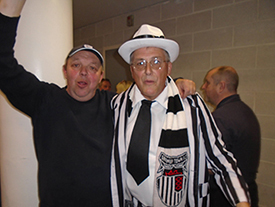 Market Raison Mariners (MRM) Big Tony and Wayne godfather of MRM. 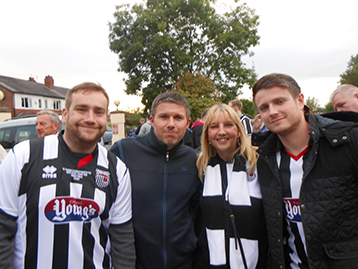 Jack MacKreth's Dad, Mum Tracey and close associate from Anglesey wanted to thank the Histon Mariners as sponsors of Jack. 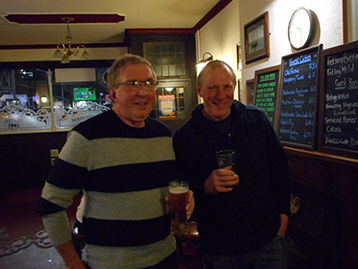 Continuing prematch preparations occurred at the excellent Barons Bar (Scarisbrick Hotel), Lord Roy of the Chesterfield Mariners debriefed all on his summer development and maintenance programme at his estate in Keswick. Whilst Gareth coached Becky, whose discomfort at wearing odd shoes was probably the lesser embarrassment caused by the total absence of reasonable wearable shoes. Obviously the daughter of the landed classes is used to more. By the end of the day her embarrassment had grown so much, even a paltry effort by Gareth to soften the blow with flowers appeared to fail. 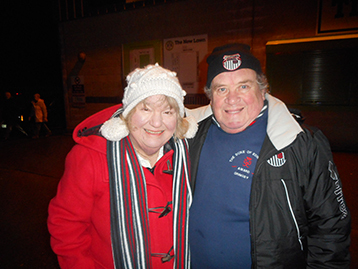 Inside the ground a bemused elderly lady, led by Sgt Dodds recognised the arrival of the Histon Mariners. 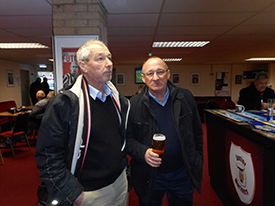 Leading lights from the New Imperial Club made special effort to welcome the Histon Mariners. Wayne and Richie prepare for and welcome the Innkeeper. Philip Serrel discretely recognises proceedings. Top Bar Maid Linda rather less discretely welcomes the Innkeeper. Meanwhile Bulldog Gaz preferring quiet solo reflection cannot find a pie because Teflon Man got there first. Controversial selection fully supported by the Histon Mariners. Having probably the best 3 centre backs in the league is difficult but Sean Pearson does add to the 'vocal levels' Omar is still very young has just stepped up a standard and needs deploying strategically. 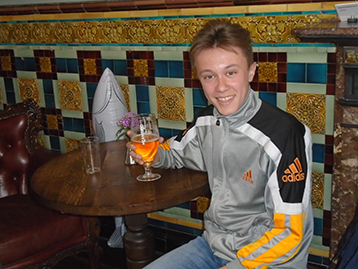 Lethal sniffer Padraig will continue throughout the season to play and score vital goals. Remember the bench - Tait, Toto, Marshall, Omar and Padraig NB thats without Nathan Arnold and Scott Brown. Another clean sheet - it was a matter of time - and more goals confirming town as the leagues top scorers. Top all round team performance. Great to see JP on the score sheet again. Man of the Match Sean Pearson with Josh Gowling close. Sean's cameo in creating the 4th goal - if it had been from a Blue and Red Shirt at the Nou Camp, would be played over and over. 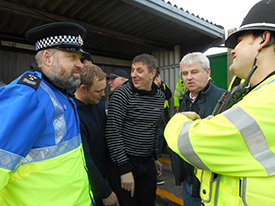 Afterwards Sgt Dodds and a bemused elderly lady thanked the Histon Mariners and his Lordship, before his return to Southport social club for the post match analysis. 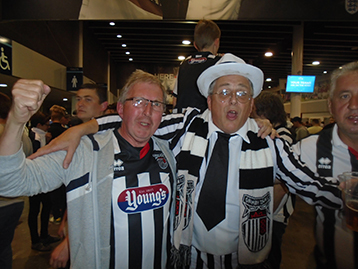 In the club Mariners faithful Grant Johnson was keen to meet Lord Roy from the Chesterfield Mariners. Less keen on publicity, were Grant's associates James 'Sergio' Martin (in background) his forthcoming Colombian and Bolivian exploits he prefers to keep quiet but claims his intent in establishing a Mariners base.....? 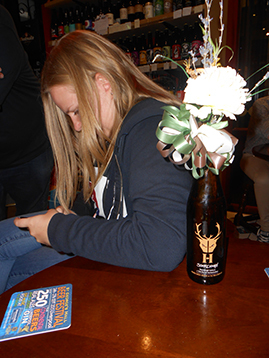 The rest of the Southport venture saw Becky forcefully keeping the rest in line. The course of love and romance was seen to prevail. 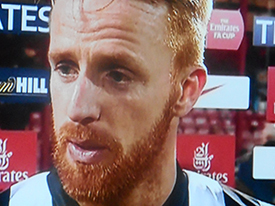 A competent if not exciting performance, with Histon Mariner Man of the Match Gowling leading the way. The draws clearly need to become wins, though the top is clearly still to reach. 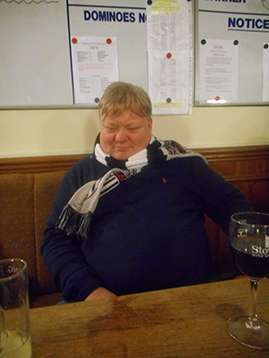 Afterwards at the Imperial, Bulldog Gaz contemplates the Histon Mariners Campaign, surprisingly without any mates. 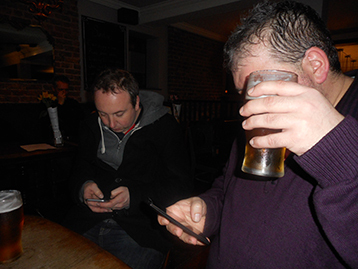 At the Notts considerable post-match analysis with Messrs Tondeur and Lowther unsurprisingly determined little. However the story re the emergence of Harry Haddock via a North London warehouse courtesy of Nigel was most illuminating. Des Lynham clearly recognised its importance and shortly the new shoal will bear testimony to Mr Lowthers 5 minutes of fame. 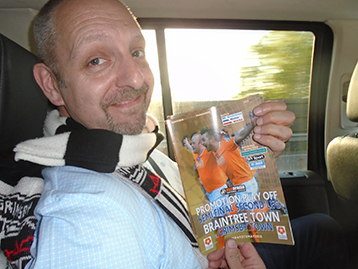 Oh what joys - the Braintree trip for the 5th time and so far 1 goal scored. Ian MacFleming of the West Ayrshire Mariners was anxious to taste, smell and feel one of the Town's highlights off the season. Beforehand at Histon H.Q. 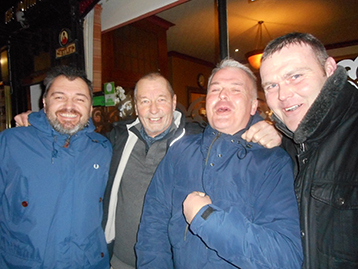 The Red Lion, Ian Mac met with x, Paul, Mr & Mrs Steve Fenty and John Fenty to discuss the days manoeuvres. 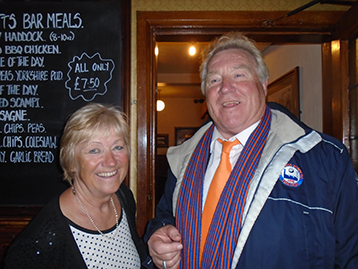 At Braintree Imperial stalwarts x and Linda were keen to discuss the campaign with Ian MacF. Alas the best laid plans do not always bear the deserved results. Difficult to say too much about an average game which Town could have won. A clean sheet was welcome whilst a point won was disappointing. 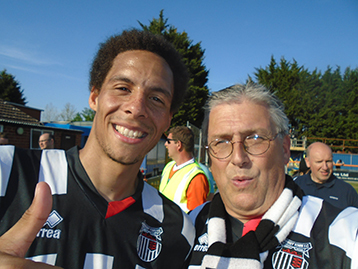 He certainly impressed when he came on and Craig Disley was as ever reliable. 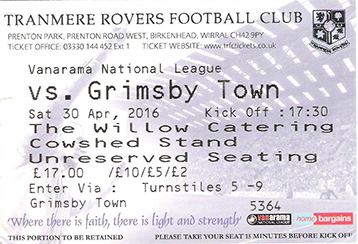 A big day for town. A big day for the Histon Mariners. 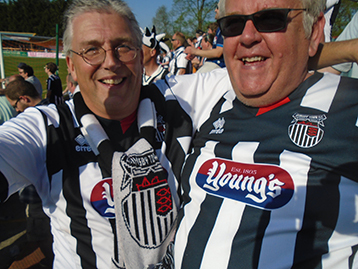 Possibly the best 2 teams in the division - a fitting occasion for the relaunch of Harry Haddock. 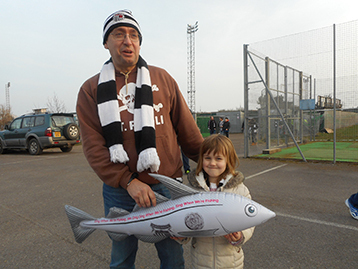 The Histon Mariners are proud and delighted to be so closely associated with the blow up plastic fish. 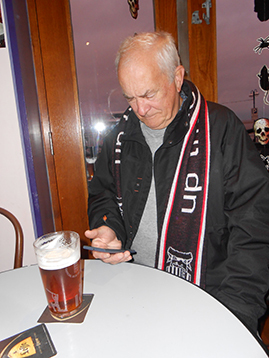 After an early start to ensure punctuality, President Maurice checks his schedule ahead over a 'green tea' at Willys. 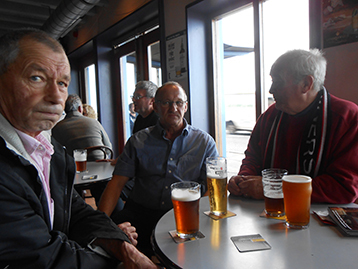 At Blundell in the Mariners Trust Bar, the President and Dave Roberts discuss the campaign. 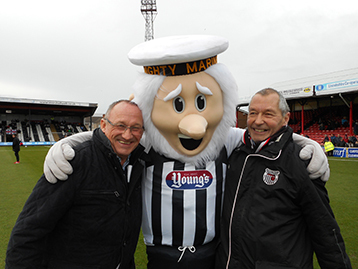 On the pitch Mighty Mariner was delighted to be around to welcome the President. 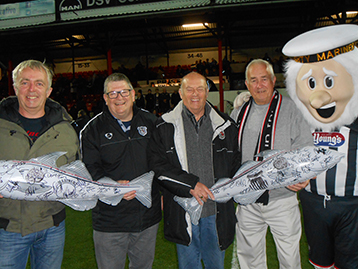 The President presents Harrys to the Mariners Trust. Shoals of haddock are soon to be released. Mariners everywhere are sure to make a catch, to own one. 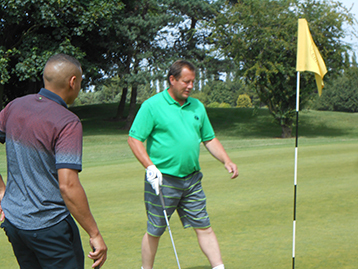 Proceeds can only help Paul Hurst and the club generally. 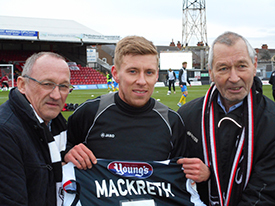 Histon Mariners sponsored Jack McKreth was also on hand to thank the President. 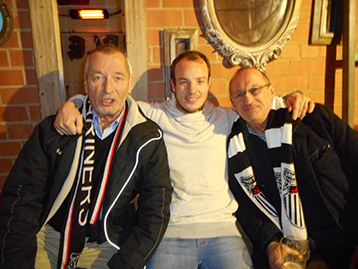 Excited Town fans everywhere included old sporting colleagues of the President. 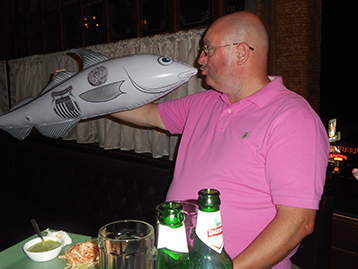 Mike who also went on to star with Louth FC and provide so many of the Presidents goals, Steve was keen to get hold of a haddock. The match itself was the classic game of two halves. 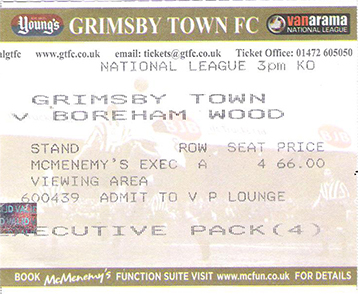 First Town could easily have gone in two goals up. A hand ball 2-3 yards inside the box was given as a free kick outside the box, the resultant penalty could have sealed a significant victory. Second half a different story. Cheltenham readjusted and caused Town problems. It has to be said after the first half Town were poor. However the loss - the first in 13 games! will be the spur for another unbeaten run. 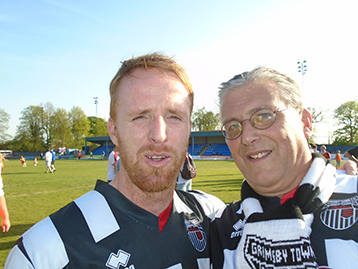 Histon Mariners Man of the Match - difficult but Sean Pearson and Toto looked as solid as ever. 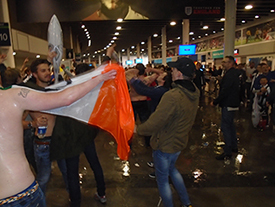 After the match the President was keen to ensure Town fans remained buoyant. 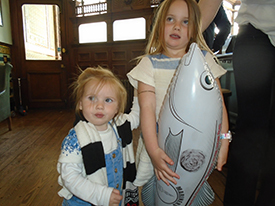 Here gangly teenager John Boy with Youth Protege Sophie with obligatory haddock are reassured by Ray the Fish and McMenemy Mike. 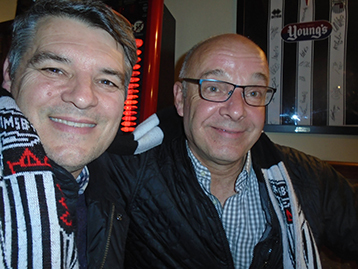 Post match analysis was obviously conducted at the New Imperial, the Notts (with Messrs. Lowther and Tondeur) but also at a new venue for the Histon Mariners, The Peoples Bar. 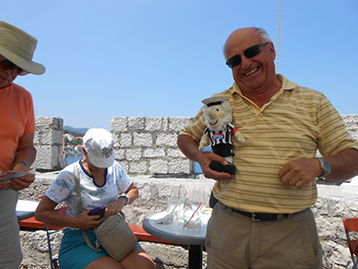 Stuart Bateman (surprisingly awake) thanks the President for his efforts with a coffee at the Peoples Bar. 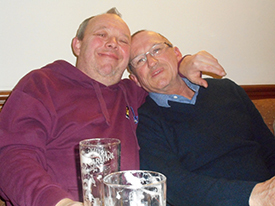 At close of play - surprisingly early - the Chairman of the Wainfleet Mariners and Latin speaking friend of the Histon Mariners, Innis thank the President for all is efforts at Cleethorpes HQ. The Kingsway. After the tremendous efforts of the Dean of Fitness in his last sojourn in Cleethorpes, the Bar Hill Battle-axe took particular interest this time and laid down very strict criteria for his efforts ahead. The Dean aka 'The Inspector' arrived early at the Kingsway in view of his workload. 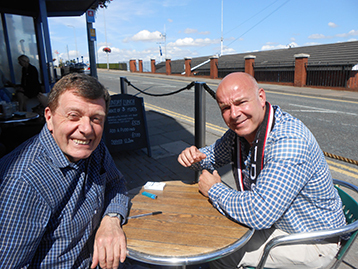 After initial briefings at Willys and the Notts, the Dean moved onto the Mariners Trust Bar, where he briefed the Chairman of his plans. 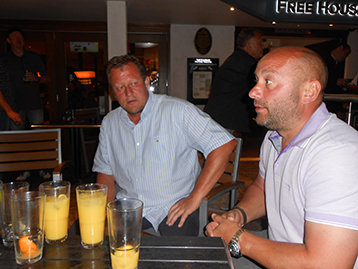 The Chairman aghast at the plans ahead immediately contacted Paul Hurst, current players and former players. The Chairman coordinates with Hursty re. the Dean’s plans. 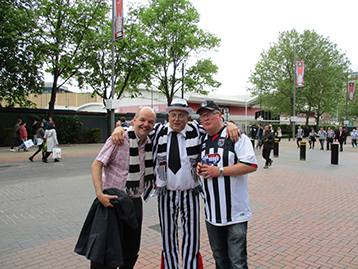 The Chairman in consultation with legends	Dave Boylen and Nigel Batch. 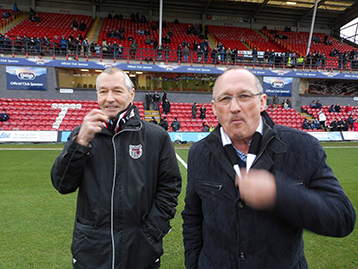 Invited onto the hallowed turf, the Chairman and the Dean pushed ahead with Campaign Promotion. Our glorious leaders contemplate the likelihood of success. 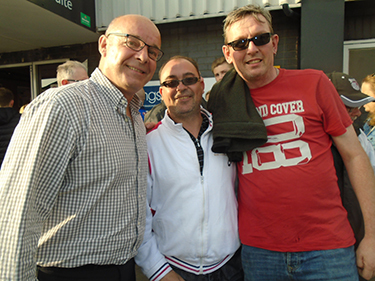 Andy Carr aka Mighty Mariner greets the Dean and the Chairman. 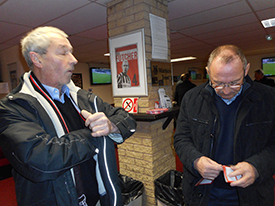 Histon Mariners sponsored Jack MacKreth & JP thank the Mariners for their support, advice and help. The game will not be one that sticks in the annals of time. However three points a clean sheet and another goal from that Di Amond Geezer ensures Town are hot on the heels of the leaders after 1 defeated in 18. Histon Mariners Man of the Match ...... difficult but Josh Gowling just. 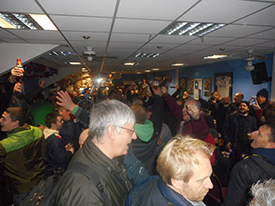 There was considerable excitement at the New Imperial Club where post-match analysis was as usual intense. 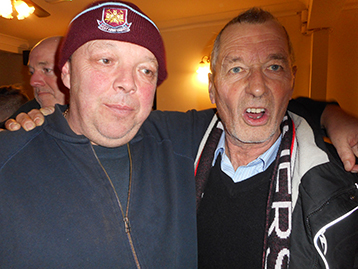 Total disbelief on behalf of Andy, “the Hammer Mariner”, with an astonished Chairman. 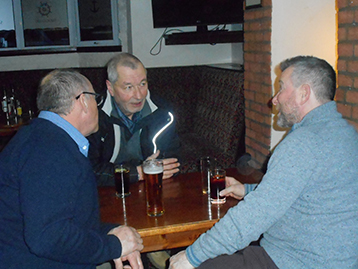 The Chairman declared himself fully satisfied with the days proceedings which he later spread to the Peoples Bar owner Brett Smith, who was overcome with the visit of the Chairman and the Dean. 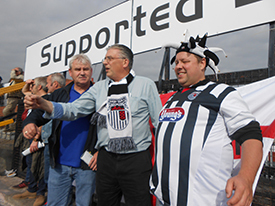 However even the Chairman could not have anticipated the extent of the response later experienced at the Notts. 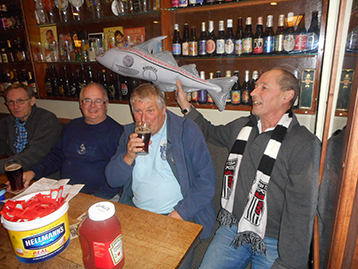 Stewart Roberts (Season Ticket holder originally from the Haverhill Mariners), Ray the Fish, Joe Clark and the	Dean toast the Histon Mariners with a slimline tonic. 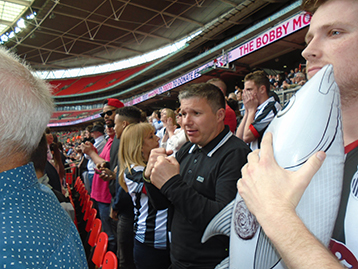 Ray the Fish and Jim Blake join in the celebration. 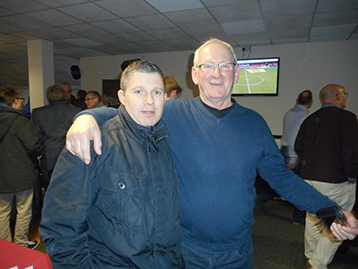 Equally inspiring was the appreciation shown by former Town Legends. 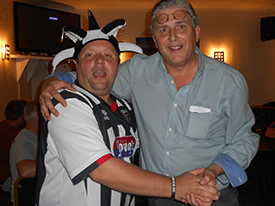 Nigel Batch who was so enthralled with The Chairman's happy jolly and informed demeanour, that he implored Legend of Legends, Joe Waters to attend the Notts to meet the Histon Mariners. 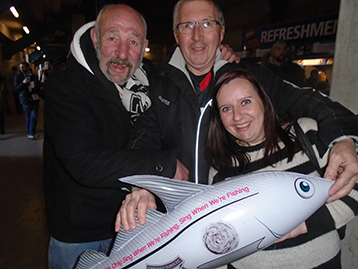 Coleen the Fish, McMenemy's Mike Nigel Batch and Lisa. Lisa, Joe Waters & Ray the Fish. 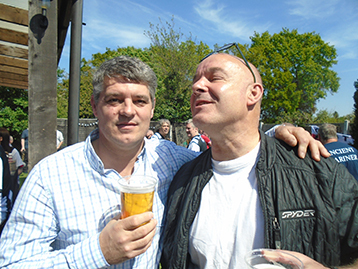 An awestruck McMenemy Mike with his hero Joe Waters. The euphoric mood continued at the Smugglers and the crowd waited eagerly when the Innkeeper was spotted guitar tuning. 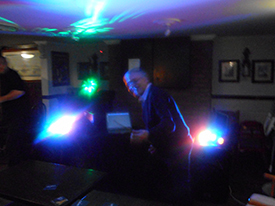 It was not long before the crowds were given the ultimate treat when the Innkeeper finished off proceedings with a display that can barley be imagined. The success of the campaign over the weekend was clearly evident. In such a state of excitement the Chairman could be excused the following morning for the mess created at breakfast. 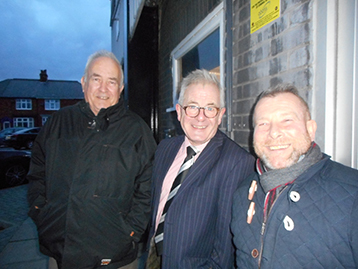 The President was intent on cementing Town's Gaelic connections by inviting Ian Mac of the Ayrshire Mariners and Harry H to assess Town's performance over a cup of Earl Grey. Whilst the President was pleased with the performance, like all of us he bemoaned the continuing bad luck re penalty decisions but praised the ground staff for the continued resilience of the crossbars. 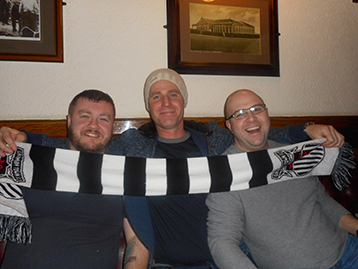 Both Craig Disley and Paul Hurst were pleased to thank the President and the Ayrshire Mariner for their continuing support and advise. 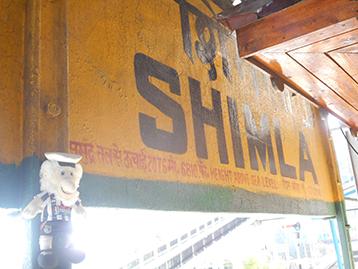 The streets of Shrewsbury were awash with travelling Mariners. 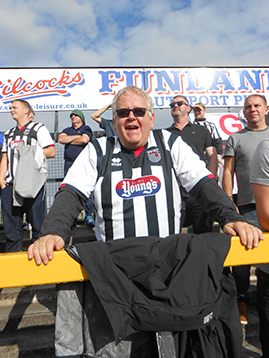 Home supporters were stunned by the efforts of Paul Hurst's Black and White Army. 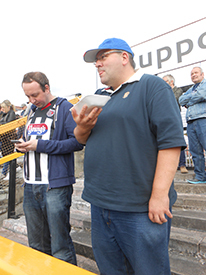 Catering staff at the ground were aghast at TM's gorging of their pie supplies. Gareth relays information on TM's efforts back to Chesterfield. And Gareth surprisingly still appears amazed when the shout goes up as to "who ate all the pies". 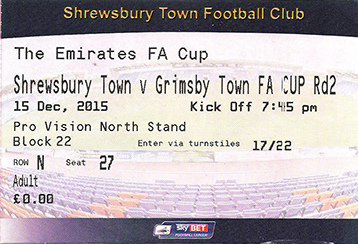 The Mighty Mariners easily matched and more often, out-played Shrewsbury Town. The injustice of the late, late goal was cruel. 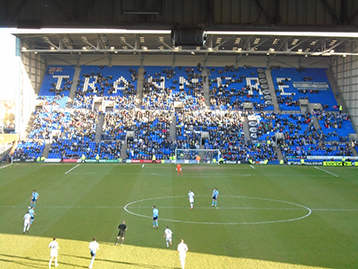 Home fans were embarrassed to have won the game as many declared after the game. 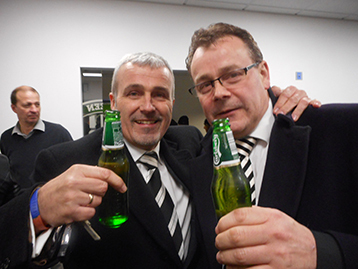 It was heard amongst the Black and White Army "that was the most one-sided game since Town beat Everton". 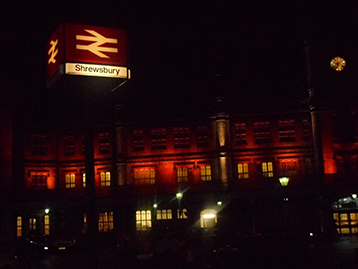 Shrewsbury fans were unanimous that town were the best side seen at Greehouse Medow this season. Histon Mariners Man of the Match Toto. 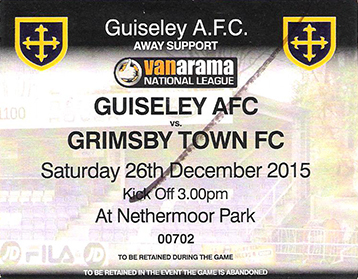 A crucial game, especially after the disappointment of Shrewsbury. 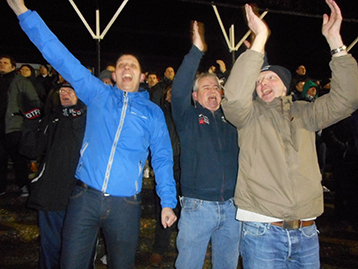 Fans appeared up-beat and looked to the Histon Mariners continued leadership. 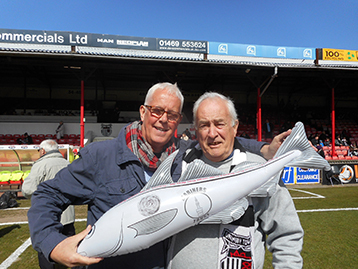 NE Lincs sporting legends Louth Steve and North Thoresby Mike sought out the President but Ray the Fish with constant adjuncts John Boy and Sophie were on hand to raise moral. 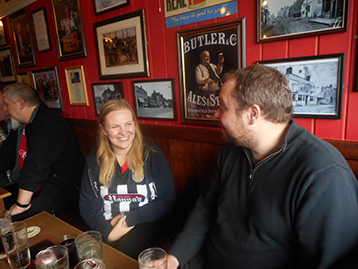 Cleethorpes born and bred Steph and a rather 'bashful' Amelie to meet up with the Histon Mariners. Amelie raised the possibility of starting a Northampton branch of Mariners. We await further news. 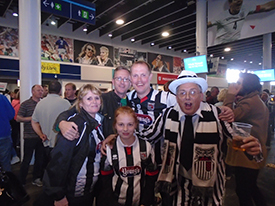 Chesterfield Mariners were also on hand as Charlotte and Becky were consoled by his lordship after finding out all the press were gone....! Chesterfield Pete (AKA the J.P. Pitman of Chesterfield Mariners) appeared to be approaching full fitness. A pie would have helped but alas - sold out. A hard fought game ensued with Dovers man to man marking making it very difficult for Town. 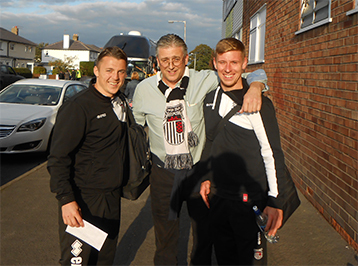 But spirits remained buoyant, led by Josh Gowling, Toto and Craig Disley. As time appeared to be disappearing, at last a penalty given to Town ensured 3 points - once Podge calmly put the ball away. Histon Mariners Man of the Match. James McKeown. 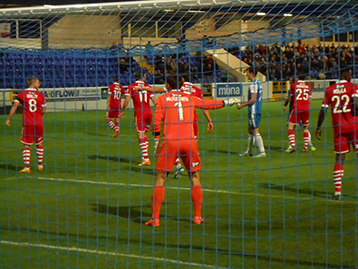 2 world-class saves either side of half time clearly kept Town on level terms. It would have been unfair to have seen Town behind but James Mc certainly proved himself and early season doubters wrong. 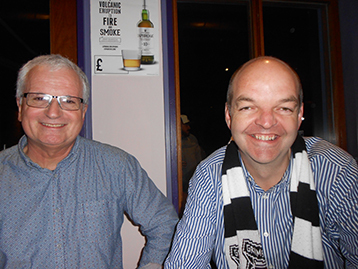 The customary post match analysis at the new Imperial Club provided for much intellectual and insightful view. Sadly Gordie Gaz preferred solo analysis without any mates. 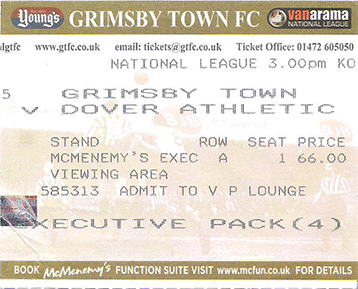 It cannot go without passing that the above ticket was donated by a concession-valid Mariner of whom we appreciate his ailing efforts. 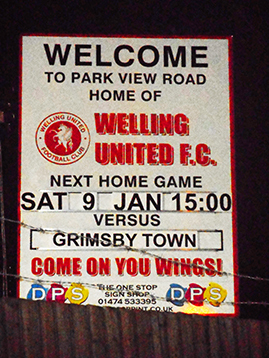 Following the unfortunate but inevitable Dec-Jan hiatus the Histon Mariners Campaign was back on track at Welling. 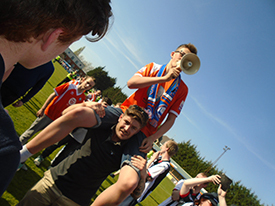 As can be seen Welling invited fans to "come on their wings" and town supporters took them at their word. 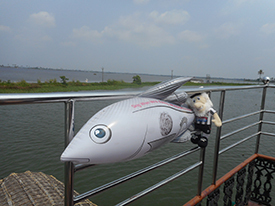 In a gate of 1300 over 800 Mariners descended like flying fish. 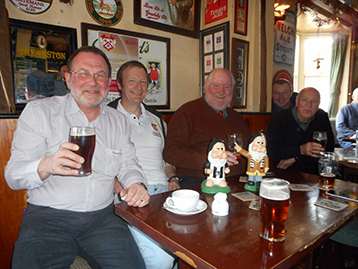 Meeting up with the Chesterfield Mariners at the excellent Door Hinge proved a thirst-quenching and invigorating start to the day. Brother-in-law Phil commiserates with Becky over her heavy burden but is soon overly concerned about the danger of her poor (apparel) in particular her holy boots. Which soon looked to have had success with TM pointing the way. 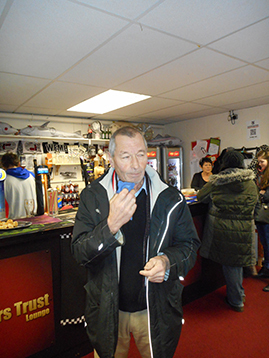 Further pre-match preparations took place at the Welling Utd Social Club. 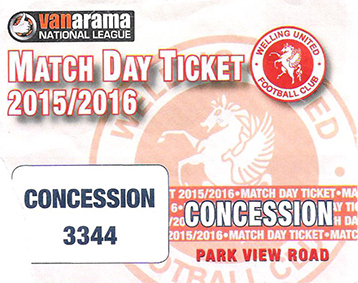 Welling supporters were astounded at the size of the shoal that descended. 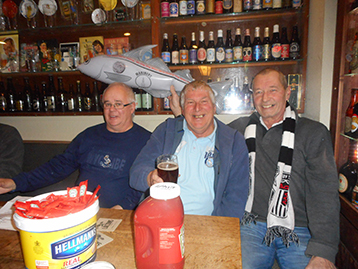 Further gratitude was paid to Lord Roy for his attendance and Tony from the Purley Mariners took the opportunity to cement relations over a ginger beer. 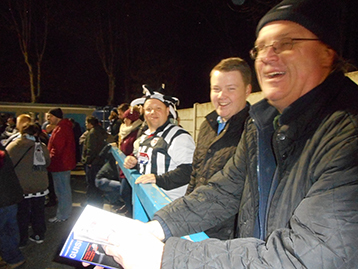 The anticipation inside the Park View Road ground was awe-inspiring. 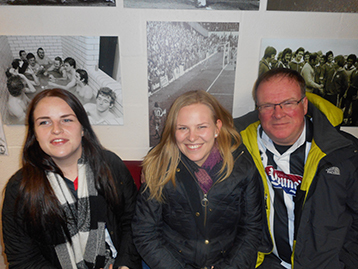 Friends and associates of the Histon Mariners were present to mark another memorable effort. 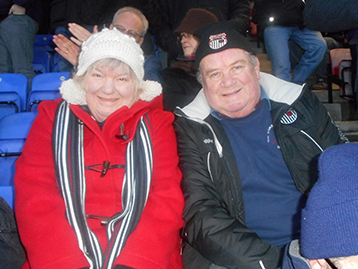 The ever present Sgt Dodds and the rather bemused elderly Sue, once again were on hand with their support. 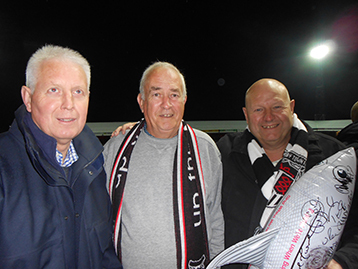 Big Tony, Chairman of Market Raison Mariners welcomed the Histon Mariners. 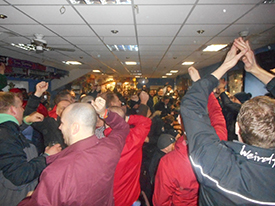 The inspirational support based at the New Imperial Club were present en-mass as ever. A fantastic victory with Padraig again "scoring when he wants"....three times!!!! Captain Disley's fine effort ensured a confidence boosting 4 v 0 victory. Significant displays from Josh Gowling (again) and with Gregor Robertston minimising the loss of Conor Townsend, hopes spring eternal. 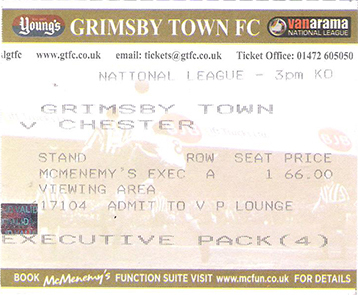 Further food news that Paul Hurst remains settled made for a great away day, again. One issue that must be commented upon was the wearing of gloves by Omar - oh dear! 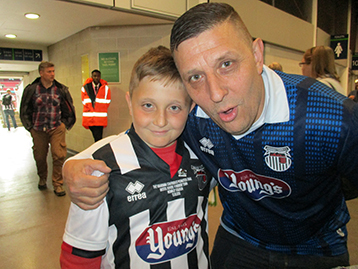 We are confident a goal or two will see a surge in confidence and Omar begins to chase Podge's goal tally. 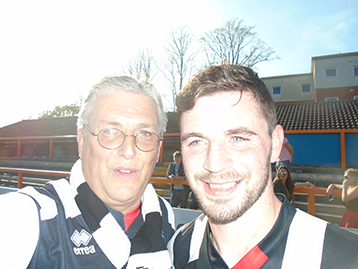 Histon Mariners Man of the Match has to be Padraig Amond. Post-match analysis at the Door Hinge continued a great day and is a watering hole that can be wholeheartedly recommended. 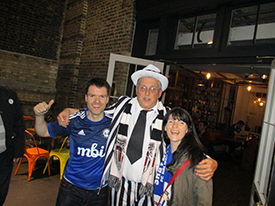 On to Blackheath at the Railway post match celebrations continued unabated but for Phil's mounting concerns over Becky's poor apparel. Phil tries to comfort his younger sibling and points out potential help for Becky. 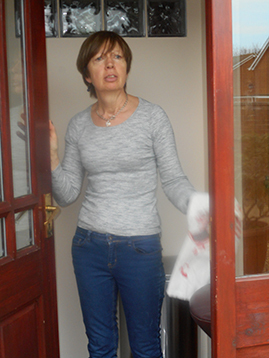 Ultimately with the help of Brother-in-law Phil, Becky with dampened enthusiasm comes to terms with her dilemma and accepts the need for help. We trust in future, Gareth with assistance from caring Phil, that Becky will achieve a state of right and proper match preparation. Intentional low key manoeuvres are now difficult for the Histon Mariners, following the continued successful relationship with the Mighty Town. 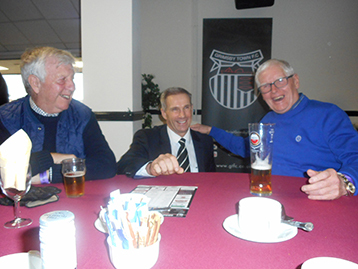 Pre-match preparations at the Notts saw a warm welcome from old friend Will with Muzzy and Wellsy. 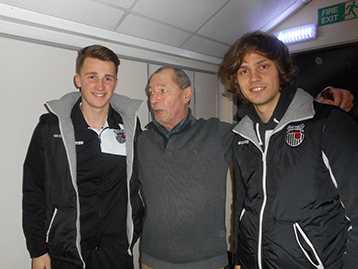 The Histon Mariners were pleased to be able to welcome back Muzzy after his long-term break. 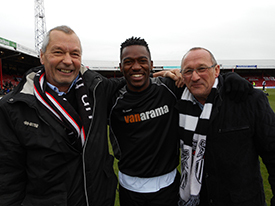 Committed as ever we hope Muzzy will continue to be available for the rest of the seasons campaign. 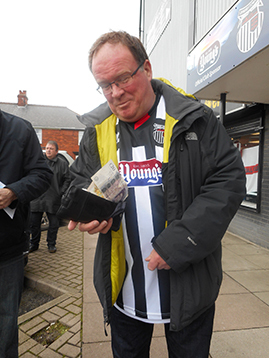 Outside Blundell Lord Roy of Chesterfield was	as ever willing to spread a little cheer whilst TM was in search of a pie. 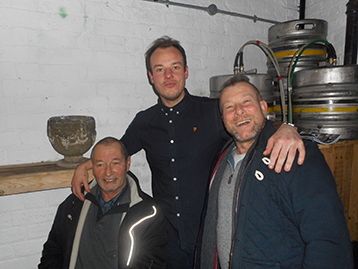 The excellent McMenemy's provided its usual hospitable environment and saw Barry, Nathan and Ollie from O.Turner Installations, keen to associate with the Histon Mariners. 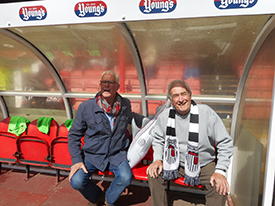 The vast experience of Barry and Ollie shone through and will prove a valuable associate of the Histon Mariners who are always delighted to listen to 'tales from the archives' from such characters. 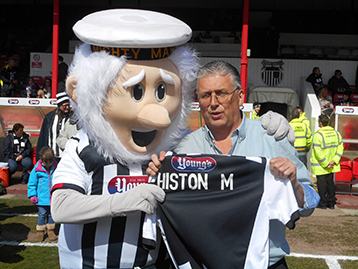 John Fenty was equally delighted to embrace the Histon Mariners latest association. 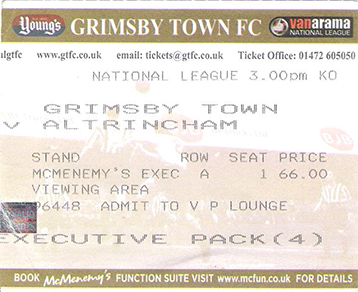 It would be churlish to suggest Town rarely hit top gear in the 5 v 0 thrashing of Altrincham but they didn't. The early success of Andy Monkhouse set the pattern for a result everybody would settle for beforehand. Incredible disappointment to see Gregor Robertson helped off with what looked like a serious setback. The 'Diamond Geezer' again proved 'he scores when he wants'. Another Monkhouse goal and further goals from Nathan A and Omar illustrated the diversity of goal scorers within the team. MAN OF THE MATCH RICHARD TAIT was solid but OMAR BOGLE with a goal in successive games looks to be contributing much more. 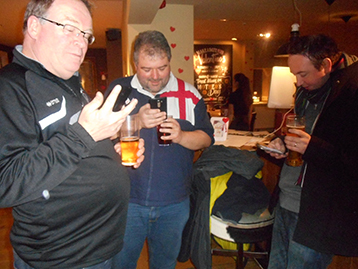 Post match analysis at the New Imperial saw the normally lonely Bulldog Gaz unusually jubilant. We hope and trust this is a sign of things to come. At the No2 Bar a frightening display of 70's dance techniques was led by stalwarts Bamber, Loz and Ritchie. 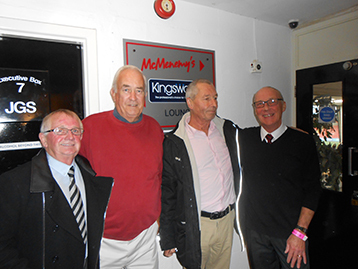 So much was their performance appreciated, they continued at the Kingsway Club to further delight Cleethorpe's revellers. Their rendition of Mud's 'Tiger Feet' will live in the memory forever. "That's right, That's right, That's right, That's right"
The Bromley fixture is finally played - the dire weather accurately indicated the likelihood of a game where the result would be paramount and the performance of little consequence. 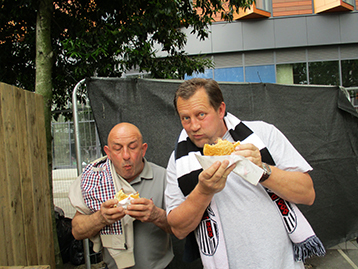 A pre-match urgent search for pies took place with customary vigour. Lord Roy adding considerable experience to that well known double act TM & Gareth. His Lordship having sorted out the problems for his underlings invited the Innkeeper to join him and proceeded for a fine dining experience away from his minions. 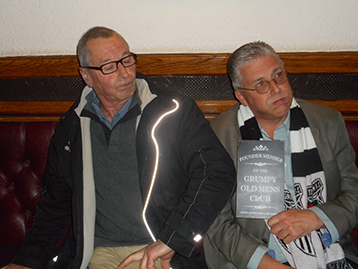 Meanwhile TM & Gareth partook of Bromley F.C. 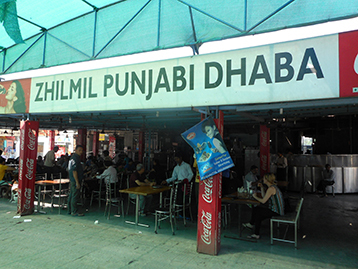 's culinary delights. 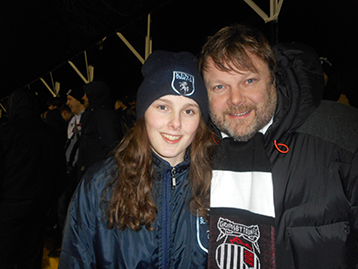 Long standing associate of the Histon Mariners, Chairman of Purley Mariners was on hand to welcome the Histon Mariners with youth prodigy Rebekah - last reported as being loaned out to Crystal Palace and 'allegedly' being looked at by England as a potential goalkeeper. 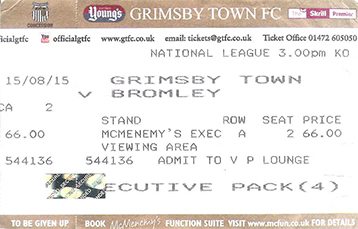 As mentioned a grim evening that got worse with Bromley's early goal. However the Mighty Town battled and battled and then battled again, producing goals from ......Nolan and JP for a most welcome and gritty 3 points. Nolan looks to be settling in well and could well provide another goal source from mid-field. Histon Mariners Man of the Match RICHARD TAIT. 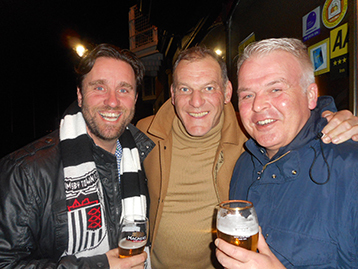 Paul Hurst's Black and White Army was particularly pleased with the gritty victory none more so than Imperial Club delegates Loz, Wayne and John whose passionate display truly represented the post-match mood. P.S. 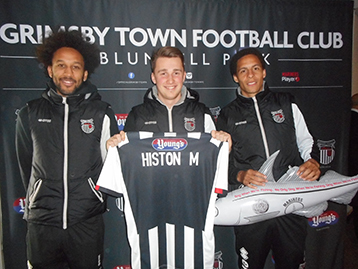 Hot News: Evan Horwood new signing from York City has been sponsored by Histon Mariners. 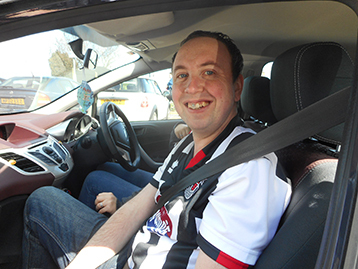 A day that was to end in intense disappointment, started well with strong Norwich connections, debutant Kevin was delighted to join the Histon Mariners on manoeuvres. 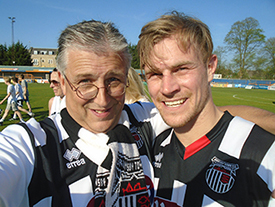 Whilst assessing the origins of former Town legend Ryan Bennet, Kevin was keen to forgo closer relations between the Histon & Thetford Mariners. 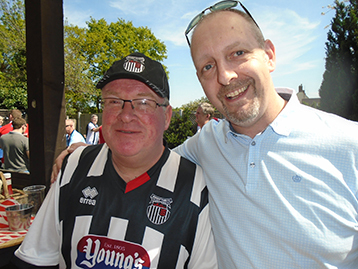 Histon Mariners President Maurice was on hand to brief Kevin on the long term aims and objectives, and consolidate the Histon-Thetford alliance. Fortunately, the Dean concluded his room inspections at the Kingway and was able to join the President in briefing Thetford Kevin at Willys. 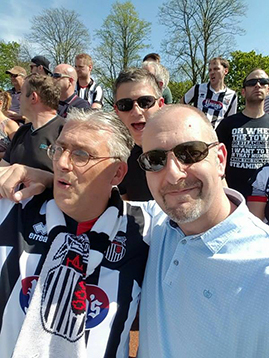 Onwards to the Notts where the Chairman and Innkeeper joined up and in conjunction with Notts Workhorse Will continued pre-match preparations. 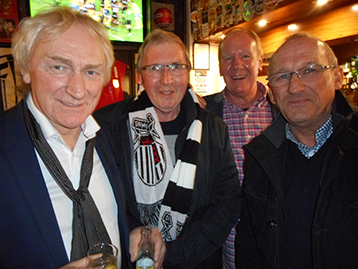 GTFC Director Philip Day was on hand at McMenemy's to welcome the President and new associate Thetford Kevin after the successful negotiations at Willys and the Notts. 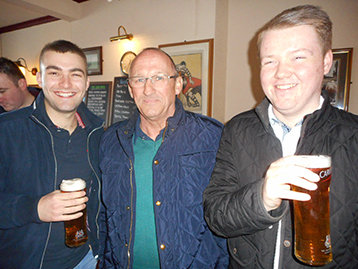 At McMenemy's young stalwarts Callum Bastock, and Josh Sunter were most anxious to meet the Chairman, who as ever was most approachable and most generous with his experience and wisdom....! 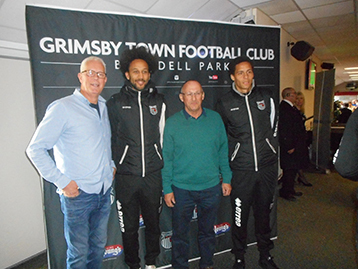 Match Sponsor Grimsby Mobile Fishmonger were equally keen to express gratitude to the Chairman for his generosity and bonhomie. 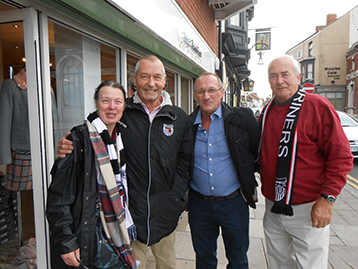 Long-standing friends of the Histon Mariners Ian McLean and Brian Fisher were joined by Paul (centre) who were clearly excited at also meeting the President. A most disappointing afternoon made particularly difficult by the weather condition. With Town's rivals pulling further ahead, automatic promotion now appears a distant dream - though not impossible!!! Another Wembley, appearance when the roll of a dice can make or break everything, now looks likely. Little to say about a rather turgid affair but a clean sheet and the improvement of Man of the Match JAMES NOLAN are small positives taken from the match. 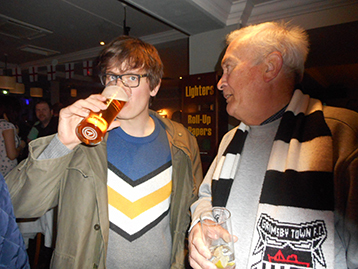 Unsurprisingly post-match analysis at the New Imperial Club proved a therapeutic interlude. Thetford Kevin fully embraced what he'd describe as a "unique experience". The Dean of Fitness helped with analysis and diagnosis to several Imperial Stalwarts. 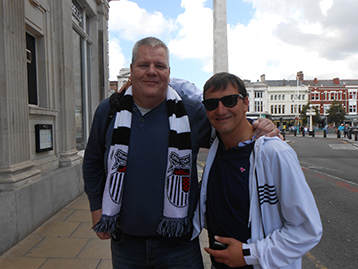 Firstly Albert aka Crowman and later to top Cleethorpes Chef, Paul. 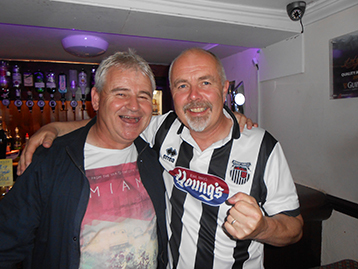 On to the Peoples Bar where owner and Local Resident Medication Officer Brett was on hand to renew acquaintance with a very Jolly Chairman and welcome Thetford Kevin. 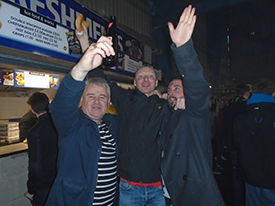 Town fans everywhere took the opportunity to basque in the welcoming bonhomie of the Chairman. 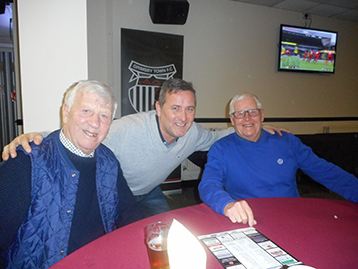 After further advancement of the Histon Mariners campaign the Chairman and Dean of Restoration Projects and Fitness invited the Chairman of Thetford Mariners for a night cap. Over a 'hot chocolate' a full review of the day and clarification of future plans was put to bed. PS. 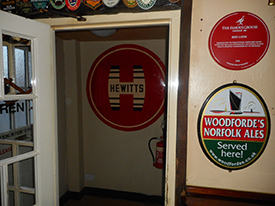 Hewitts continues to raise awareness at Histon HQ, The Red Lion, where Mariners are always welcome to Dock. 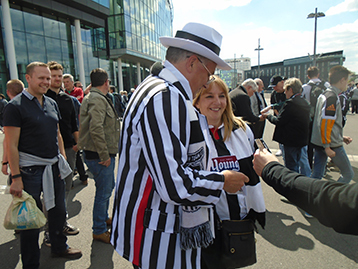 Whilst the mighty mariners continue to forge ahead on the pitch, the Histon Mariners campaign to spread the word and promote the essence of the British game rather than the pampered theatrical world of the Premier continues unabated. 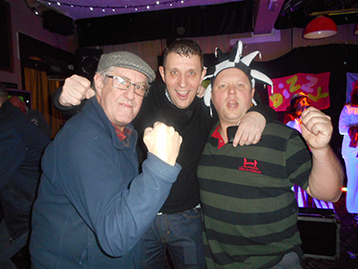 An unexpected and exciting day at Histon H.Q., the Red Lion illustrates the success of the campaign. 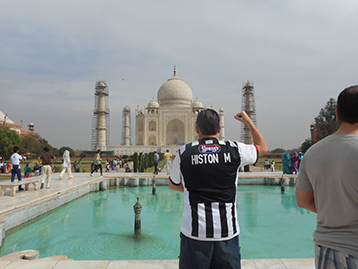 The Prats made a near-spiritual pilgrimage to establish links with the Histon Mariners. A delighted Innkeeper was on hand to welcome the band of disparate individuals who amazingly create an illusion of being a vaguely coherent fighting force. 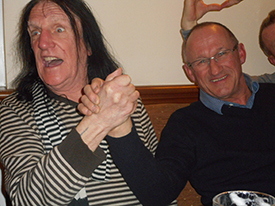 A very, very, long time established vanguard party of Kettering Town F.C., the Prats were keen to establish connections via the shared experience of Alan Buckley whose managerial career began at the Prats home. The Prats will prove to be a terrific link to the Histon Mariners and both parties look forward to a mutually profitable association. 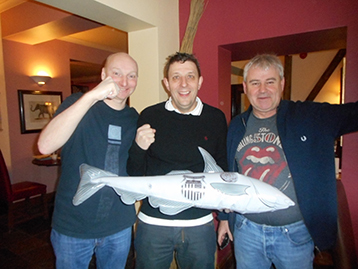 A Shoal of Prats were keen to be photographed with The Gaffer and his sidekick in the Red Lion. Pharp (smiling?) and downwind 'Parker' (official Prat Chauffer) Fuggles (Logistics Director), Marshall and Dog-Face "Between the Sticks". P.S. 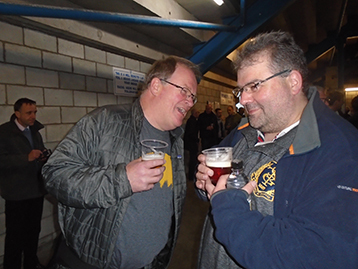 Poppies Real Ale Tasting Society are available for viewing @ pratsktfc.com. 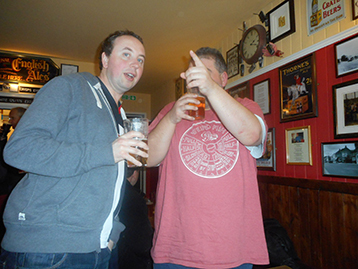 Following the Prats visit on Saturday, Tuesday saw the arrival of WWISC at the Red Lion. 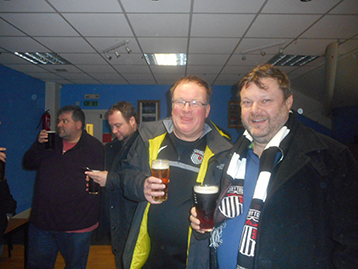 Wycombe Wanderers Independent Supporters Club were enroute to another ground in the area but obviously wanted a solid foundation of sustenance and refreshment at Histon H.Q. 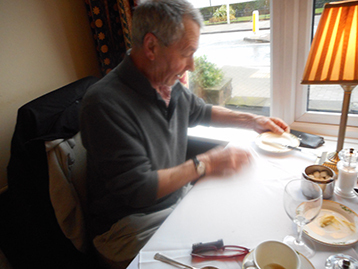 Logistics Director Colin ensured his members were well catered for in liaison with the Innkeeper. 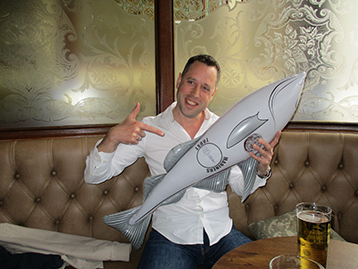 The 57 varieties of requests from Martin "Heinz" were well catered for and we hope and trust his forward journey was all the better for his Red Lion experience. 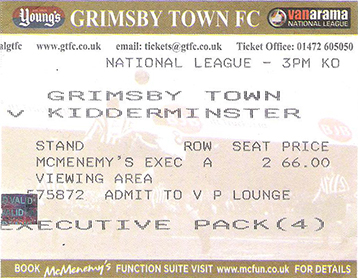 The Mighty Wycombe Wanderers were fully appreciative of the Histon Mariners efforts and understanding of the position of GTFC. The common bond of J.P. Pitman was a useful plank on the bridge building exercise between the like-minded clubs. 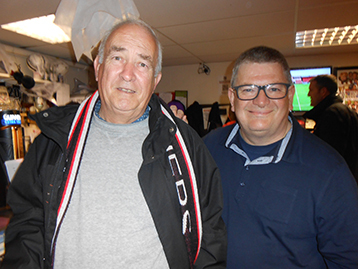 Histon Mariners Chairman, ever joyous and welcoming, was on hand to greet WWISC. 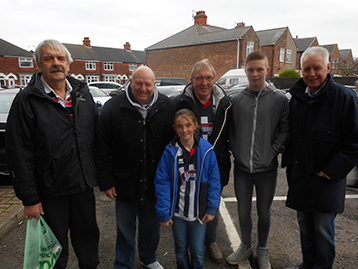 Here Harry Haddock and the Chairman welcome WWISC leaders Ian and Colin. 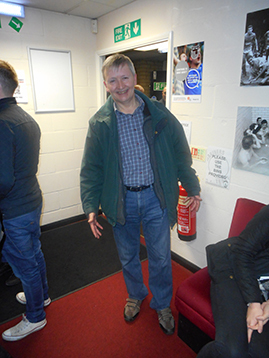 Brian joins the WWISC leadership and as ever the Chairman of Histon Mariners seen to be as cheerful and accommodating as ever. PS Note the evidence of Martin Heinz successful evening. An enlightening experience lay ahead on the journey towards Stroud. 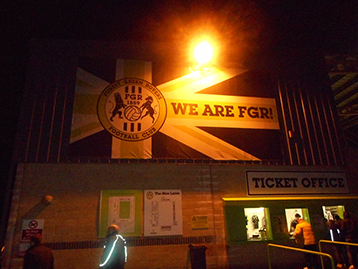 On arrival to all intents and purposes the home of Forest Green Rovers, New Lawn, appeared much as any other recently built functional but characterless ground. 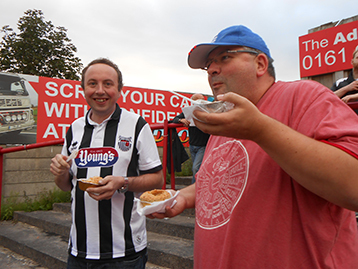 Inside the travelling Black and White army of Paul Hurst were treated to a feast of pumpkin burgers, Peruvian quinoa from Lake Titicacca, Ubuntu Fair Trade Cola and vegan gluten free, dairy free and MSG free crisps and popcorn. 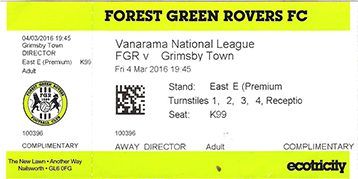 Added to this, as the game wore on, FGR served an increasingly intense long ball game. In the first half the Mighty Mariners contained Forest green without too much bother to James McKeown. Jon Nolan covered many miles and appears to have become a key element. With Dis pushing forward in the second half, Town looked ever the more likely to score. 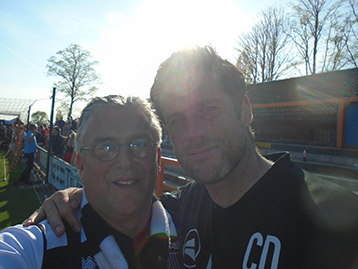 FGR goalkeeper (their Man of the Match) kept Town at bay but could do little with a terrific Craig Disley header. Histon Mariners Man of the Match, the Mighty Sean Pearson. 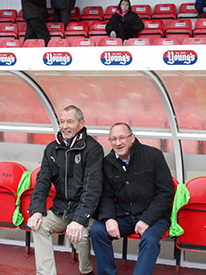 Sean has occupied the bench rather too often in the eyes of many Town fans but his loyalty and commitment are an example to many. 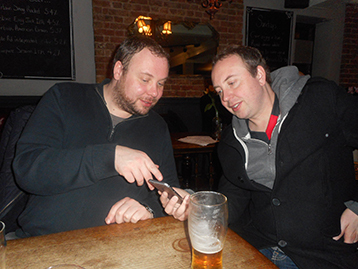 Post-match analysis proved ever enlightening led by Chuckle Brothers Steve and Paul. 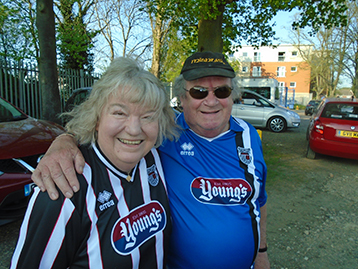 A happy but slightly bemused elderly lady chaperoned by Sgt Dicks was clearly delighted with the Mighty Mariners. 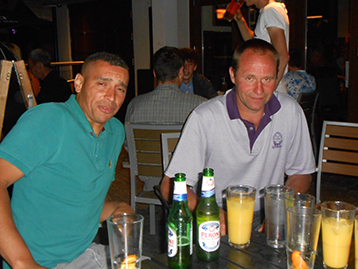 Once in Stroud Imperial Stalwarts John, Loz and Wayne were eventually refreshed with non-organic shandies. 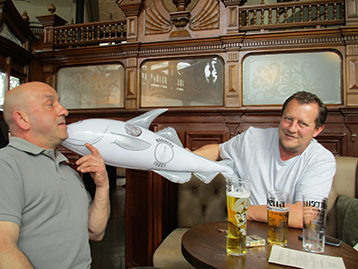 Wayne welcomes the Chairman of Northampton Mariners, Gareth to post-match analysis at the excellent Prince Albert. 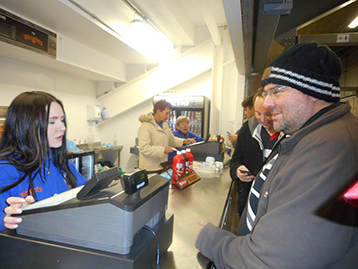 Loz, whose gluten free trainers drew considerable interest in the New Lawn Stadium and beyond, was keen to check on the availability of toasted teacakes and late night ovaltine. Post-match analysis continued in conjunction with Forest Green Youth Academy members, where Loz in particular felt inspired to make many contacts......! 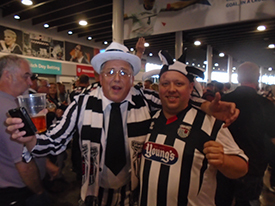 The morning after saw a jubilant Black & White Army planning future manoeuvres including the trip to the Mighty Bognor Regis. 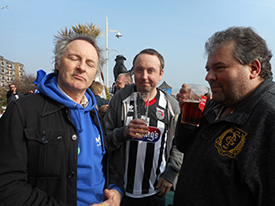 John, Loz and Wayne completely refreshed and anxious to march on - obviously with Harry H.
Pastures new - TM claims 291st ground visited Cleethorpes Promenade Chairman of the Islington Mariners and Gareth appear incredulous or bemused, it is difficult to determine. However first signs of summer sun, with opportunities to people watch (including an entourage from Leeds dressed as 1980's wrestlers - Yorkies!!!) 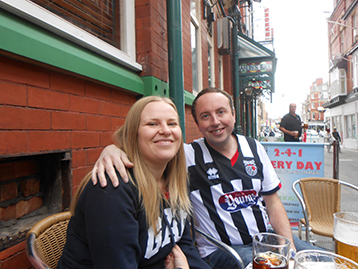 at the Aviator which proved a fertile ground for pre-match refreshment. 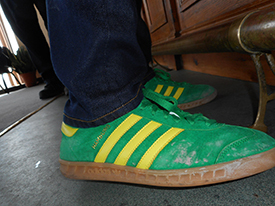 At Nyewood Lane, Loz was questioned by the local constabulary about a fluorescent pair of trainers last seen at a school leaving party in Stroud. Wayne was able to vouch for Loz but concurred that the said items were best left indoors. A purely functional result, leaves the return leg with something to play for but Wembley looms again for the Mighty Mariners. Man of the Match - difficult and probably best not awarded. 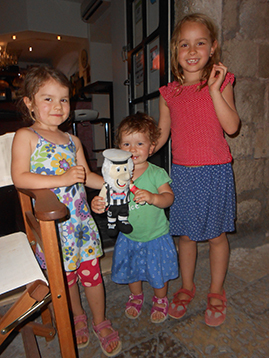 The continued success of the Histon Mariners Youth Development Programme was clearly evident. Hunter currently starring for Orpington FC Youth sides - a great, great grandson of .... Osmond, whose memory is preserved as the name of the said stand at Blundel, was proud to wear colours and display obligatory haddock. Rebecca, a little coy was clearly aware of Tim's secret manoeuvres in Bognor, the President of Rutland Mariners is under official secret obligations but was keen to accompany Rebecca with obligatory Harry to the game. Post-match analysis saw information forthcoming on to his Lordships absence. All is well, his Lordship simply had landscaping issues to attend to on his estate, given the proximity of spring on the horizon. His personal chauffeur guaranteed his Lordship will not be overstretched as will the helicopter awaiting his arrival in New York to ensure his sightseeing will be conducted in the manor (sic) he is accustomed to. 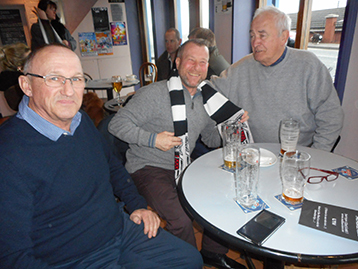 The Black and White Army were joined by the Histon Mariners for a trip back in time to BPH - Early refreshments @ £1.60 per pint consumed amongst the Grimsby Mensa Group in a 1973 disco environment (B & B available @ £20.00 per night or £80 per week). 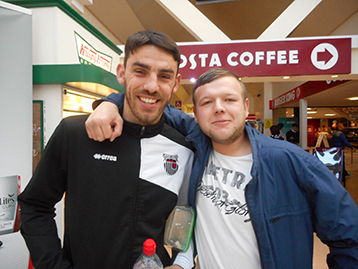 At Ferrybridge services a rejuvenated Sean Pearson was "delighted" to see Cafe Apprentice Andy but particularly keen to thank the Histon Mariners for their relentless pursuit of football reality. A particularly cold evening accentuated the delights of Nethermooor Park. 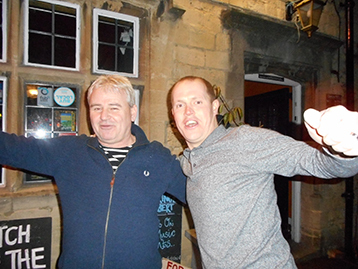 Ritchie as ever with .... and Derby Andy clearly enjoying themselves at said venue. The Innkeeper was most concerned with the physical well-being of Mighty Mariner aka Andy Carr. 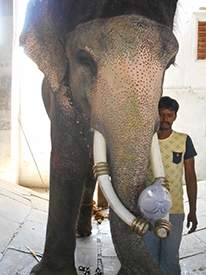 His entourage reported severe sickness on the journey to said venue - we hope he was not as bad as he looked. 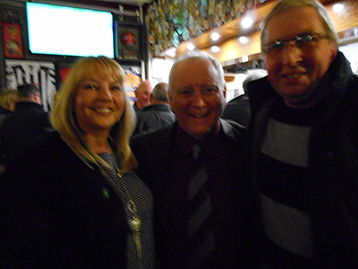 McMenemy Mike and Lisa were on hand to report the gradual improvement of Purley Mariner President Tony following his sudden curtailment of duties. Notable first half from Ryan Jennings and equally in the second from Nathan A. Patrick Hoban looks to be finding his feet but clearly tried through lack of match time. But on a cold and frustrating evening MAN OF THE MATCH was Jon Nolan whose tireless efforts would have earned more on other occasions. P.S. Lord Ray's landscape improvements and seasonal demands are progressing well and is expected back on parade - obviously in a prominent role - soon. The Welsh Dragon descended on Blundel on the back of 6 wins without conceding a goal - the Mighty Mariners produced a good all round performance to end that run and should probably have had things down up before a last minute score which the experienced Josh Gowling took calmly 'in hand'. Good performances throughout the team, Histon Mariners Man of the Match our own sponsored Ewan Horwood pushed closely by Captain Marvel. 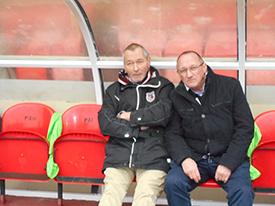 Beforehand the meticulous preparations of the Histon Mariners were clearly evident. 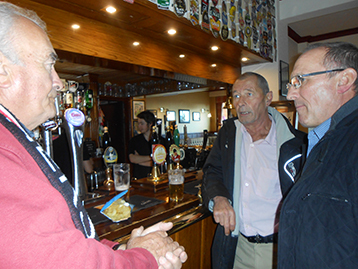 Initial consultations at Willy's with Mr. Parkinson continued at the Notts where the Chairman of Wainfleet Mariners was welcomed by the Notts Landlord, Roger. A rather bemused Roger welcomed Stuart before he had his customary mid-match nap. Outside Blundel Derby Mariners led by Dan were clearly expecting the Town juggernaut to advance further and thanked the Histon Mariners for this contribution. Likewise legendary dancer Loz with junior mariner Josh. Inside Blundel McMenemy Mike looking a little pensive is reassured by the ever present Gerry. 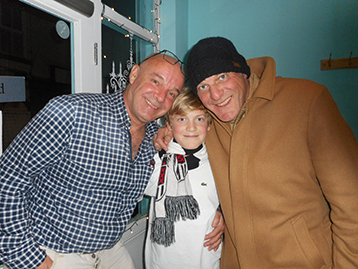 Afterwards a fully awake Stuart B met up with Town legend Andy Moore and Histon Mariner sponsored Colt, Henry. 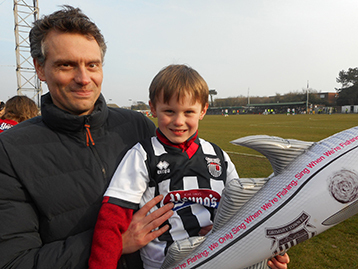 Henry has been inspired by the sponsorship of the Histon Mariners and has assumed his teams captaincy. 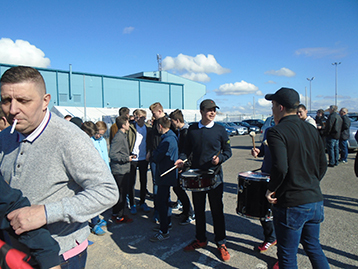 We trust the continued success of that youth campaign will continue to prove as successful next year. 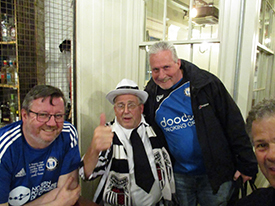 A tremendous meeting of the Littleport Mariners Chairman Brian, Clive with legend Andy Moore proved the extent of Town's worldwide support. 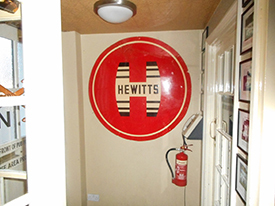 Chairman Brian and Clive are fully accustomed with the Histon Mariners HQ, The Red Lion and often meet under the Hewitt's sign. Caistor Mariner Quinny and McMike were clearly awestruck at the extent of the trawl and toasted further success with a Chocolate Milkshake. 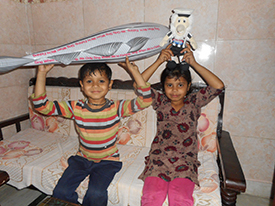 India was in a state of tumultuous excitement with the prospect of the T20 World Cup Cricket final, the arrival of Mattie Mariner and Harry Haddock and finally the Duke and Duchess of Cambridge. 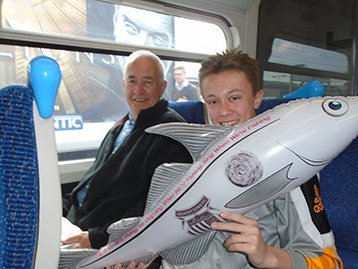 Pre-arranged meetings with Acton Mariners were conducted with considerable excitement. 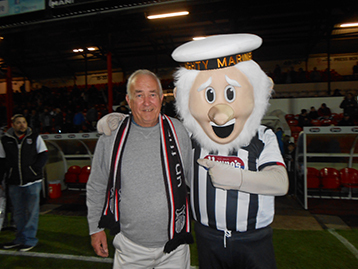 Mattie is welcomed by the legendary Acton Mariner President John Reeve. 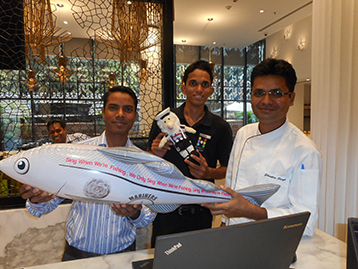 Booking into Hyatt Hotel Candolim, created a considerable commotion as staff competed to welcome the intrepid duo. 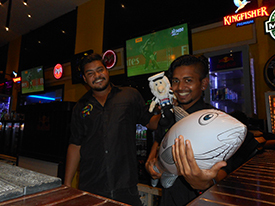 Giutjar Ansari, Sagar & Chef Jildendra welcome Harry & Mattie. Later whilst England were attempting to be second to the West Indies, Mattie and Harry circulated to appease fans and promote the Histon Mariners campaign. 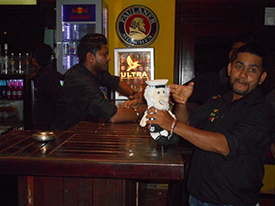 At the Cape Town Bar, Baga staff were enthralled at our duo's visit. 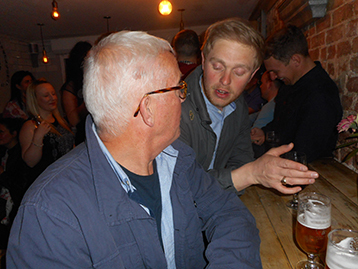 Harry in discussion with Acton Mariners Chairman about future joint ventures. 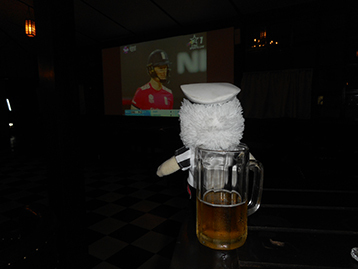 Mattie settled down to watch the T20 final whilst England batted. Later with Acton Mariner and Run Machine John Reeve. 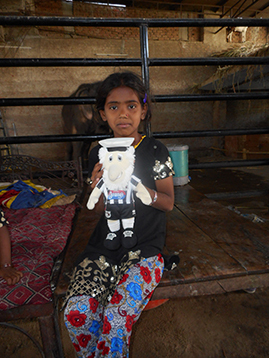 The tour continued but unfortunate circumstances surrounded Mattie and Harry's visit to the Taj Mahal. 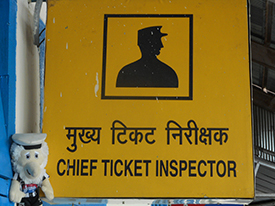 With the Duke and Duchess of Cambridge visiting the following day, the Indian Secret Service could not take the risk of mass hysteria during the visit of our intrepid duo, whilst preparations were made for the following day. 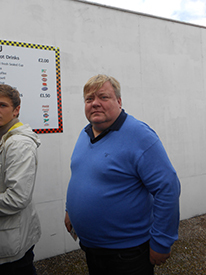 Harry and Mattie were escorted from the site for safety reasons leaving the Histon Mariners to tour alone. 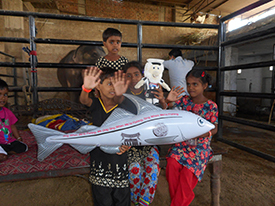 Japiur proved a more successful visit and children in particular had waited anxiously for the visit. 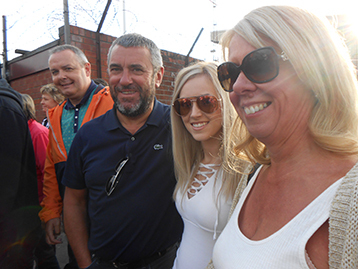 After official receptions, Mattie and Harry went to meet their fans. 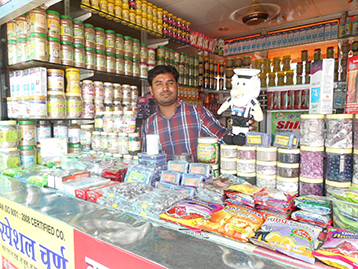 After the hectic schedule Harry in particular took time to relax with local help. The warm welcome and appreciation shown to our two heroes bodes well for the future of the Histon Mariners Youth Programme in the Far East. Their personal chauffer increasingly came to appreciate the importance of the campaign. 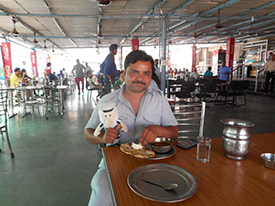 At a well-known local eaterie, Mattie discussed the Campaign with Shakeel over a working lunch. 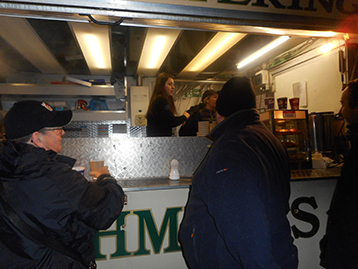 Equally local traders were keen to be associated with the Histon Mariners Campaign with the obvious commercial benefits forthcoming. As Mattie moved north, similar scenes were to become all too familiar. 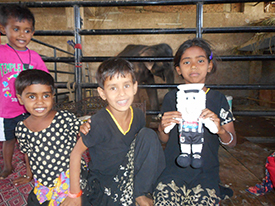 On arrival at the local station, officials were on hand to greet him as were the ever present enthusiastic youngsters. 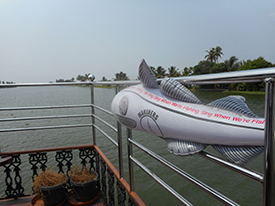 The intensity of the two weeks, spreading the net of the Histon Mariners gave way to a more leisurely tour of Kerala, where Harry in particular found the Plaice most conducive. 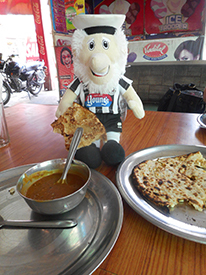 Without doubt, the Histon Mariners message was well received and the Youth Development programme should rise to unforeseen heights and glory after Harry and Mattie Mariner provided yeast to the plentiful Indian dough. Whilst Mattie and Harry were away on Commercial and Development duties, a minor blip in the Mighty Mariners Campaign gave rather fanciful ideas to those teams who had spent most of the season on Town's tail. 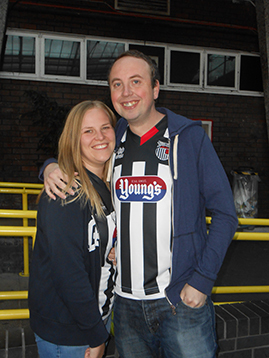 Back on home soil, Tuesday 19th saw normal service resumed with a Podge hat trick at Woking to ensure a 3 v 1 victory. 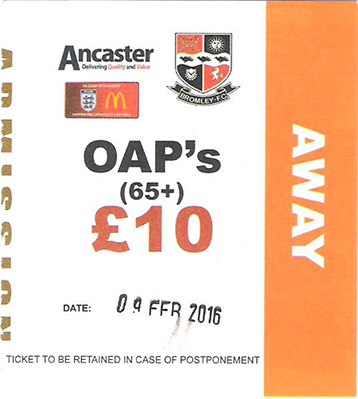 Against Chester a full-blown appearance from the Histon Mariners was designed to help the final push of Operation Promotion. 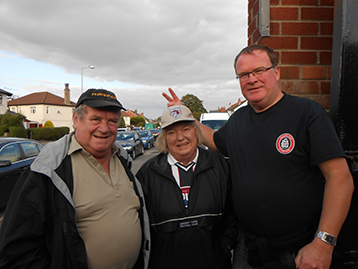 Manoeuvres obviously began at Histon HQ, the Red Lion, The President however surprised his passengers with his chosen route to Cleethorpes which included a surprise visit to Doncaster. Debate ensued as to the reason, whether it was the evident degree of nervous tension or the lengthy performance by Mr B Dear who in memory of Ronnie Corbett has put together a comedy routine which may well have distracted the President (or sent him into a comatose state). 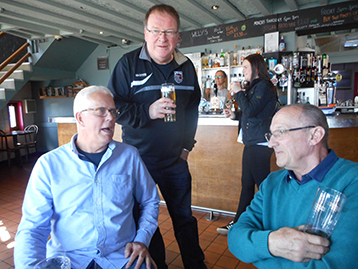 On arrival at Cleethorpes, the Dean decided against a Hotel inspection and headed straight to Willys where pre-match fitness tests were given to Brian D and Lord Roy who flew in by helicopter to take advantage of the Deans workshop. 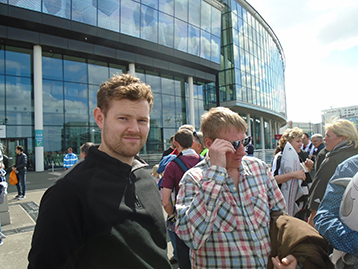 Gareth acting as chauffer/minder waited outside for further instructions from his Lordship. 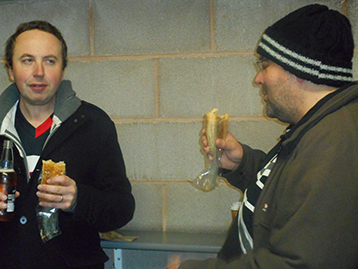 On hearing of the Dean's availability Derby Mariners Tim and Dan took full advantage, sharing a chocolate milkshake and full fitness inspection. 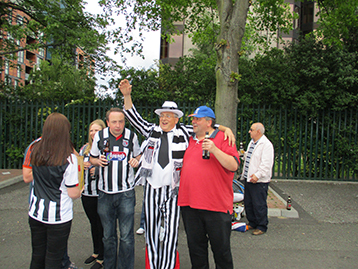 Whilst the Dean was conducting official business, our illustrious Chairman was enjoying pre-match preparations at the Notts in his own inimitable style. 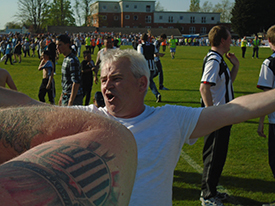 The final league match of the season at Blundell witnessed considerable excitement. 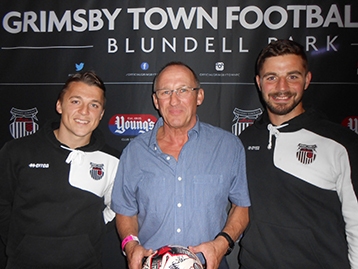 Dear and Dean, Fen Recruitment Director & Fitness Guru were welcomed by the injured Josh Gowling and Marcus Marshall. Josh in particular took full advantage of our specialist advice. 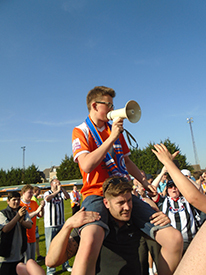 Callum Bostock was anxious to join Josh, Marcus and Harry H to celebrate the Histon Mariners. 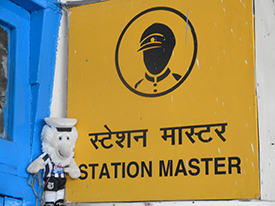 Likewise on the hallowed turf, the Logistics Director - unruffled following the Doncaster excursion - was welcomed by the Mighty Mariner a.k.a. Andy Carr who felt travel sick on hearing about the Yorkshire detour (no surprise). 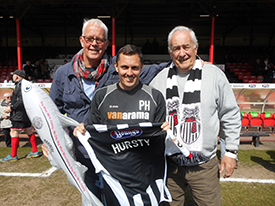 The President was joined by Fen consultant and local lothario Brian and Histon Mariners sponsored Town manager Paul Hurst. Congratulations all round for the work done this season......so far!! 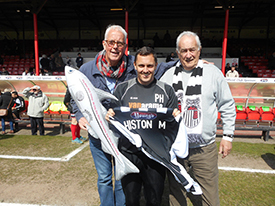 After lengthy and inspiring discussions with Paul Hurst, Brian and Maurice were keen to pass on what can only be assumed to be "Pearls of wisdom........"
Harry H was most impressed with the Wallace & Gromit of the Histon Mariners. 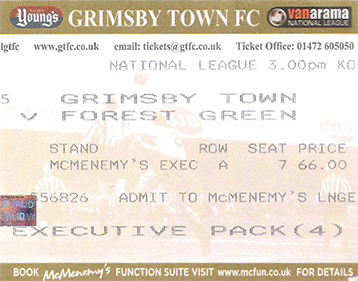 The game proved a set back but not fatally so the objective had been achieved - play-off's secured. The fun begins! 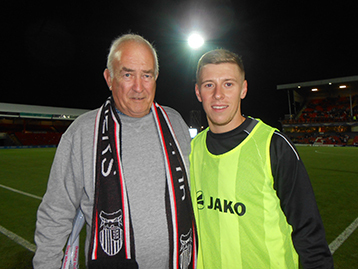 HISTON MARINERS MAN OF THE MATCH - based on effort JOHN NOLAN. Post match analysis was a little mute, to say the least. 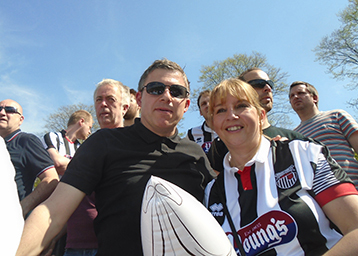 But a season-long perspective reassures that the play-off's are secure. The President and Dean make themselves available for consultation at the Fiddlers, where incredibly Harry Potter appeared and was glad of the opportunity to meet the President. The President advised a rather bemused Harry to stick to Quidditch. 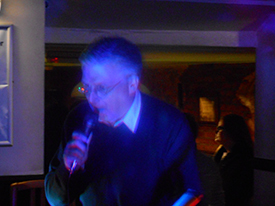 Our Fen lothario equally available, dispensed mercurial advice at the People's Bar. 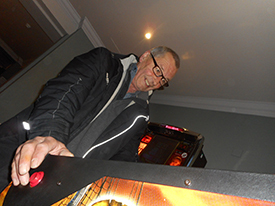 Such was the nervous energy expended by our Chairman that the Dean advised a therapeutic session as the Pinball Wizard. 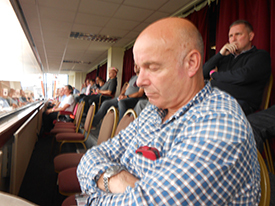 However the intensive nature of the Chairman's input to proceedings proved too much. 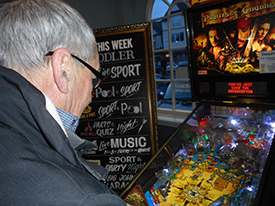 His pinball session, unsuccessful meant a further spell of contemplative reflection at the Notts. The Logistics Director in total sympathy for our overworked Chairman, indulges in a dual session of insightful and philosophical discussions. 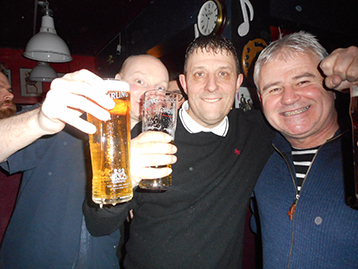 Having helped the Chairman prepare for bed, given his anxiety over an early start the following day the Logistics Director concluded with a nightcap at the Smugglers with Kingsway Restaurant Manager and Town fanatic, Simon. Basically preparation for the play-off's on and off the pitch. 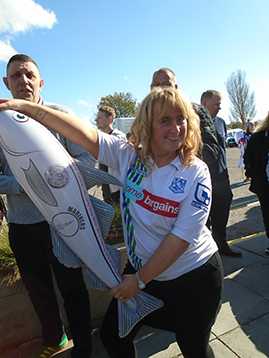 Tranmere fans welcomed the Histon Mariners and Harry Haddock and thanked them for their continuing campaign to promote "real football" and their supporters. 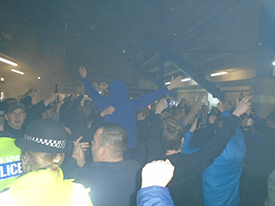 Rovers like Town, in years past, have had to adapt and come to terms with their current status. 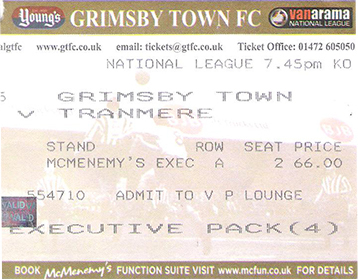 However like Town, Tranmere will surely rise again. 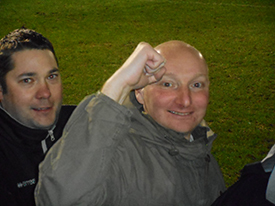 Jo Banter Page TRFC gets close to Harry under the admiring eye of Loz. 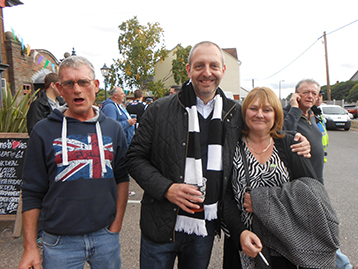 Histon Mariners friends and associates were dutifully on parade. Wayne & Loz made their presence felt. Lee listens intently to Loz (trainers out of shot) during pre-match preparations. Loz finalizes his late fitness test with a dazzling display of footwork to the sound of Distant Drums and a quick health food snack. Jay, Ray the Fish and ...... welcome Harry. 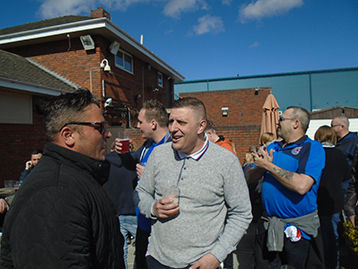 Lord Roy of Chesterfield Mariners discusses with TM the success of Paul Hurst's campaign and play-off plans. 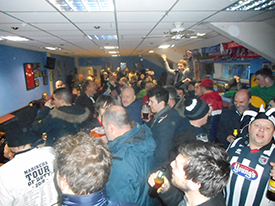 An open forum at half time ensued where Mariner fans discussed the playoff plans. Hurst's team selection was an accurate indication of his intentions. Having lost, the season is now over. 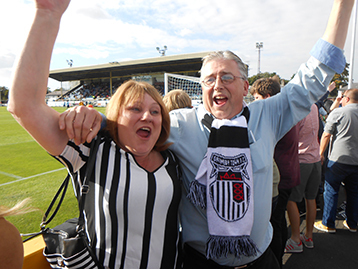 We have a new 3 game season to complete with the chance of celebration in the Trophy final against Halifax. HISTON MARINER MAN OF THE MATCH ANDY WARRINGTON!!! 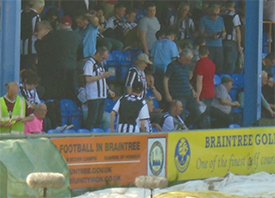 Post-match thoughts were now focussed on Braintree Town. The jinx must end at some time and now is as good a time as any. The sun always shines at Blundel. Certainly the weather only encouraged high expectations and the Histon Mariners were like all fans, positive about proceedings even though it was the dreaded Braintree. 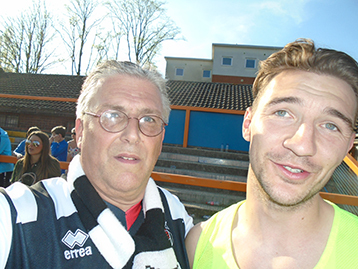 Stuart Bateman with Sean Drury - on business on behalf of Boston Utd - and Martin Bell totally at ease, expecting the best. However the Braintree jinx continues. A below par performance, a few missed half-chances, a soft penalty and the collective optimism has plummeted. 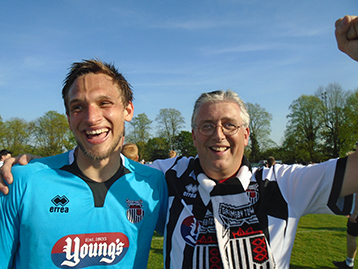 HISTON MARINER MAN OF THE MATCH, RICHARD TAIT. 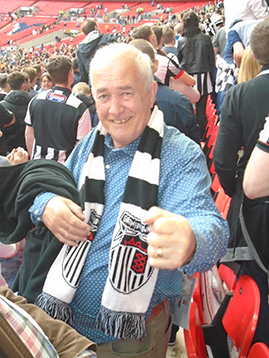 The Chairman of Wainfleet Mariners even managed to stay awake for the entire 90 minutes - on an occasion when perhaps sleep was the better option. 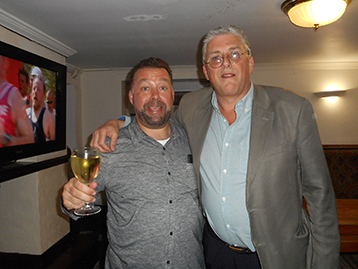 At the New Imperial Club afterwards, a rather bemused Stuart delighted Skegness Steve with his incisive analysis. 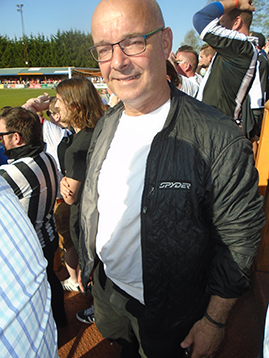 Mr Lee Harding Chairman of Braintree Town sought out the Histon Mariners at the Notts to commiserate and thank them for their sterling efforts on behalf of 'Real Football Teams' and was well aware the game was not yet won. Without doubt, all is not lost. The Mighty Mariners are more than capable of overturning a one goal deficit but a united and concerted effort from fans, players and all associated need to unite and believe. Team selection will be vital, we await Hursty's decisions. On a glorious day the atmosphere at the Orange Tree was hopeful rather than expectant. Chesterfield Mariners were keen to be in peak physical condition for what was bound to be an unfolding drama. West Ayrshire Mariner, Ian MacF was delighted to be in the presence of his Lordship and listen to considerable words of wisdom. 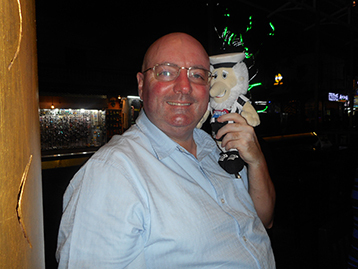 Meanwhile Skegness Steve did well to comfort an emotional Stuart, Chairman of Wainfleet Mariners. Team selection announced gave considerable hope to supporters - Hursty appeared to have played his cards well. McMenemy Mike, Lisa and Harry give approval. 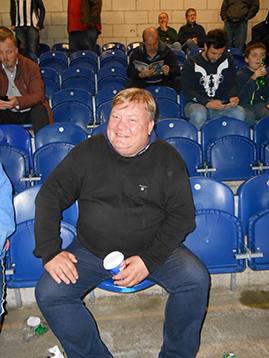 Stuart B, a proven master of always being prepared, was the only person inside the ground with a coat on. At 27 degrees we hope he didn't catch a chill, though there were occasions when it appeared unzipped! 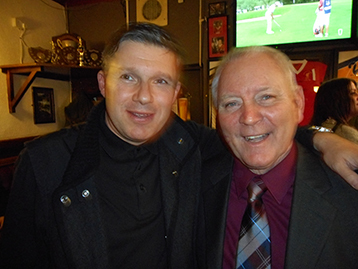 Ayrshire Mariner Chairman congratulates the Inn Keeper, now expecting a positive outcome. 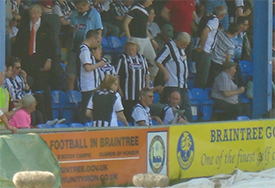 Braintree are certainly a difficult team to play against but Town's patience on a blistering hot day proved decisive. Eventually a rattled Braintree give Podge the opportunity to score from the spot. At full time - Podge in amongst the fans obviously felt relieved....! Supporters were now expectant rather than hopeful. The mood had clearly swung. 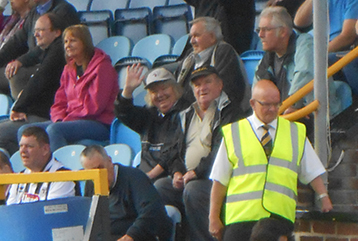 Even an elderly bemused lady was bouncing in the stand. Town's confidence grew in extra time. 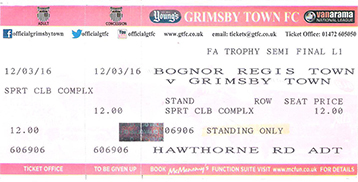 Omar Bogle scored the decisive goal, Town were through. All round good performance. Gregor Robertson, Craig Clay and Josh Gowling excellent. Just how many miles did he run? 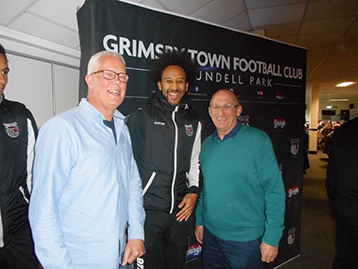 Nathan Arnold and the Messi like Marcus Marshall proved Hurst's tactics to be spot on. Could anyone have expected Marcus Marshall's display? 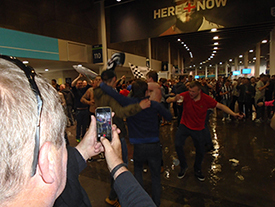 The final whistle signalled party time. Imperial stalwarts with leading light John. 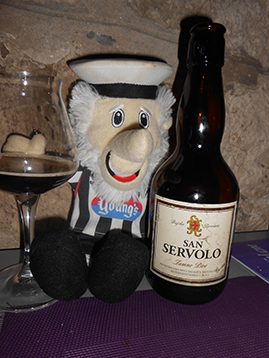 Philip Serrel seeks out the Innkeeper during celebrations. 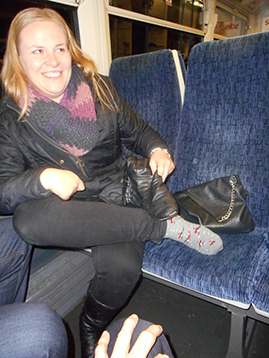 Loz - wearing lucky brown trainers. 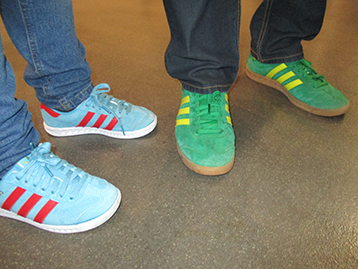 Hopefully the unlucky green trainers will be suitably discarded. 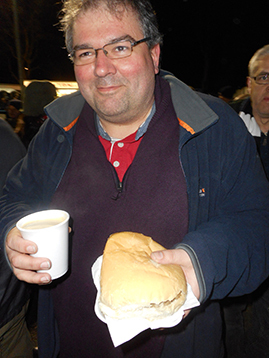 Braintree Town were tremendously complimentary, offering sincere best wishes against the West Country Vegans. 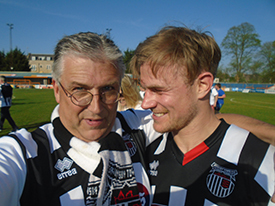 Dan North - completely in accord with the Histon Mariners - proclaimed the day as a victory for real football without the pantomime nonsense of the Premier League. 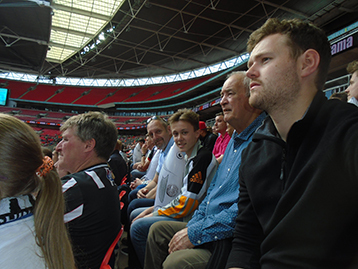 He hopes Town will be victorious at Wembley but lamented the potential loss of good friends. 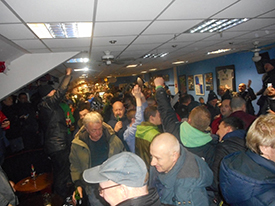 Town players re-emereged to thank and party with the fans. 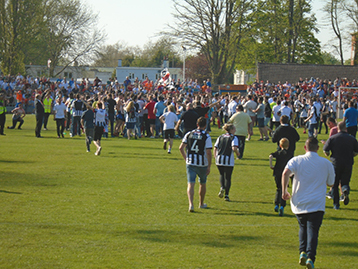 Many sought the Histon Mariners in joint celebrations. A special word from Richard Tait whose brief flirtation with Cambridge Utd he swore would be a distant memory next week. 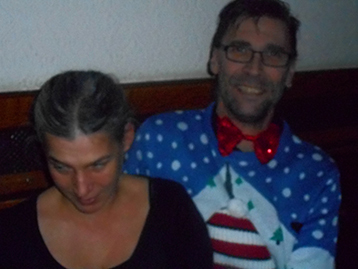 Elsewhere the party mood was clearly evident. A joyous Sgt Dodds and a not so bemused rather happy elderly lady. 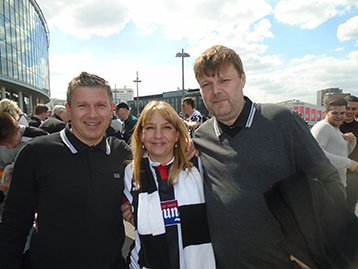 Without doubt a great and memorable day. 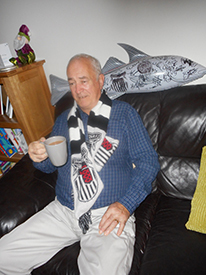 West Ayrshire Mariner Ian MacF could not wait to return to duty to spread the word. Tomorrow we return to business. 2 trips to Wembley to plan. We're coming for you Forest Green. We're coming for you Halifax. The Mighty Mariners have earned the right to put the memory of Bristol Rovers to bed once and for all. 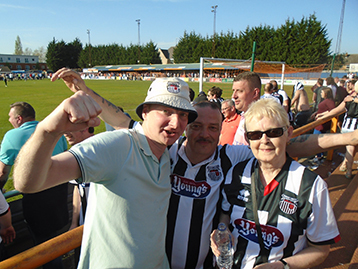 Histon Mariners have continued to expose the notion of real football - the joining together of Town fans and those of Braintree the previous week demonstrated the existence of like minds beyond the frontier of Town's heartland. Early morning preparations at Histon HQ (under the Hewitts sign) saw an eclectic selection of disparate individuals, soon to be molded into a coherent fighting force for the battle ahead. A subdued journey south saw the President brief youth protégé James, according to strict parameters laid down by Yvonne. Obviously taking the Presidents words to heart James celebrates his Histon Mariners induction with Harry H over a Cream Soda at the marvelous Prince Albert, Maida Vale. 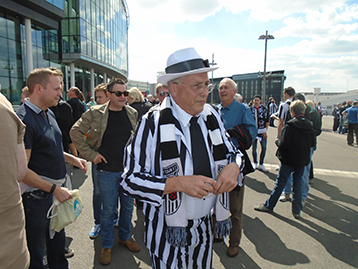 At Wembley Paul Hursts Black & White Army were keen to welcome the Histon Mariners. 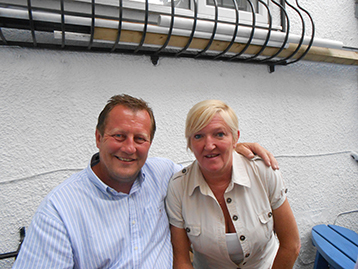 Lisa - a firm friend of the Histon Mariners with the Innkeeper. 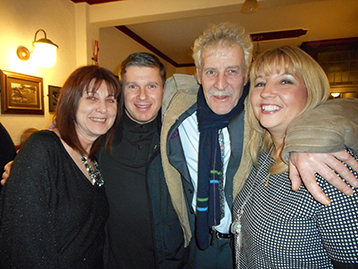 A rejuvenated Tony from Purley Mariners with MacMike & Lisa. The remarkably well traveled Dave Kenwery embraces the Innkeeper. Dave the Histon Mariners Offshore Wind Projects Consultant is always useful in the ensuing battle against Dale Vince aka "Vegan Vince..... not everyone's cup of green tea with his ideas to reform football, but the veggie burger, organic beer loving Chairman is carving his carbon-neutral way in a different direction to the desires of the Histon Mariners. 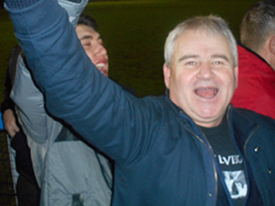 Dave Kenwery's role is testament to the Histon Mariners attention to detail in the imminent battle against Mr. Vince's Forest Green. 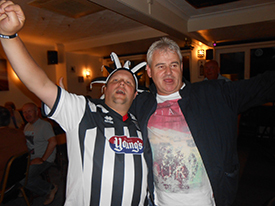 Town Legent Andy Moore and the Innkeeper celebrate in anticipation. 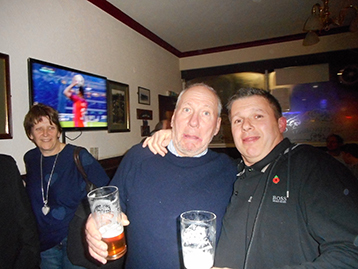 Histon Mariners sponsored Henry Moore appears a little embarrassed with the antics of the silly old fools. Henry also featuring prominently at Scartho Junior Academy as well as Town U11's Capt where there is significant interest in his mid field skills - presumably inherited from his mum. 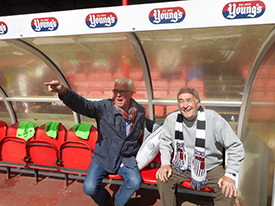 The Histon Mariners are hoping to extend their sponsorship of Henry - who we hope will in due course be less embarrassed by the "Silly old fools". Many associates of the Histon Mariners met in eager anticipation. 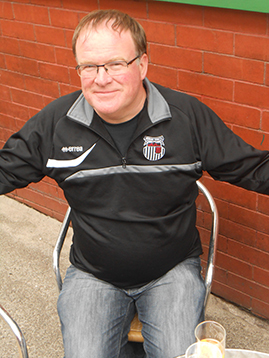 Chairman of Northampton Mariners, Gareth. Two suitably attired Mariners with Harry and sister Henrietta Haddock. Youth recruits as always excited by such occasions and to be associated with Harry H, l bodes well for the future of Town. 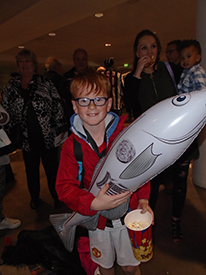 The ongoing success of the youth development programme has been well orchestrated by Ray the Fish and during the forthcoming season there is talk of early recruit John Boy stepping up to full status.........! 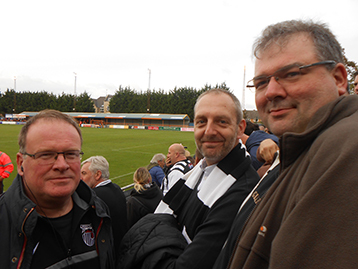 Prior to the kick off travelling Histon Mariners, whilst nervous were in total accord with events. 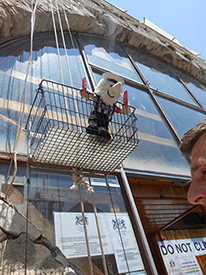 Whilst the Innkeeper continued to make a total fool of himself, Webmaster Kevin H and Gerard O'Ryan Cultural Director for Paddington Mariners look on in disbelief. Likewise the President looks on in anticipation of a successful conclusion to the campaign. 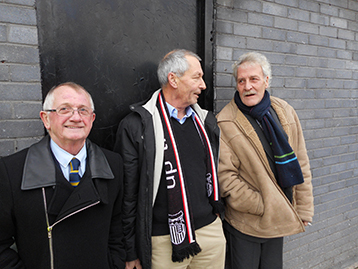 Rochdale Chairman Roger and Ely Mariner Patrick O'Mohan (along with Gerard O'Ryan) appear suitably overwhelmed. 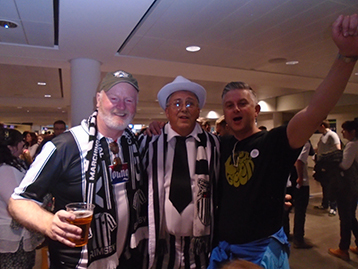 Inside Wembley the President carries the burden of expectations with Ely O Mohan aghast at proceedings, whilst experienced campaigner Ian MacF from the Ayrshire Mariners and a refreshed James appear surprisingly relaxed. Lisa can barely look whilst MacMike prays for success. A thoroughly professional and solid performance from the Mighty Mariners. 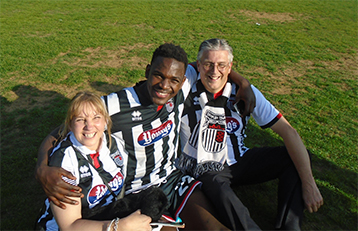 The entire team played its part with Josh Gowling, Richard Tait, Jon Nolan and Omar Bogle leading the way. The ups and downs of the seasons campaign exemplified by Omar's two goal explosion just before half time. Expectations often overspill in frustration when all is not perfect but the importance of a long-term view could certainly be considered at half time. 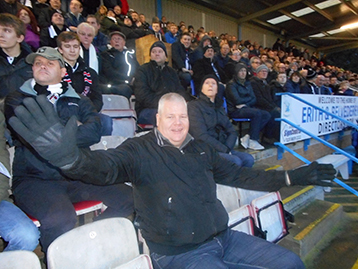 The relief of anxiety felt by Town fans with a 2 v 0 lead at half time was physically tangible. Town continued their overall dominance in the second half and Nathan Arnold's late goal sealed the magnificent occasion. 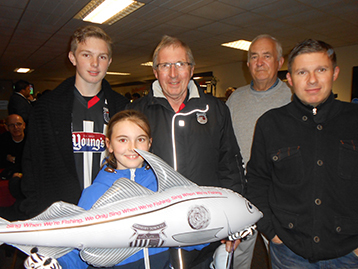 HISTON MARINER MAN OF THE MATCH: THE ENTIRE SQUAD! The President's work was done. 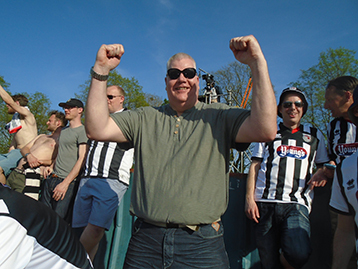 Ayrshire Mariner Ian McF was ready to step up the Campaign North of the Border. After the previous week a particularly flat end to the season. 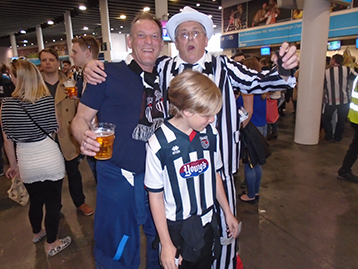 An oddball collection of Mariners fans and associates took the opportunity to see the Mariners at Wembley. 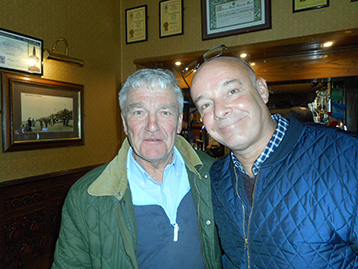 Anglo Italian Mariner Carmen & Grimsby Town Golf Day legend Andy Dickson with Harry Haddock discuss the day ahead at the Prince Alfred MaidaVale. 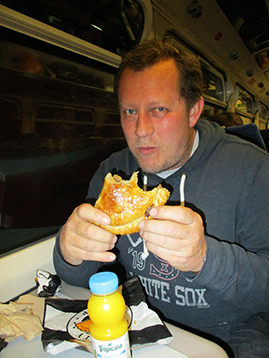 However physical sustenance always a priority of Mr Dickson was consequently at the forefront of maneuvers. Soon to be followed up with a selection of Pies en-route. 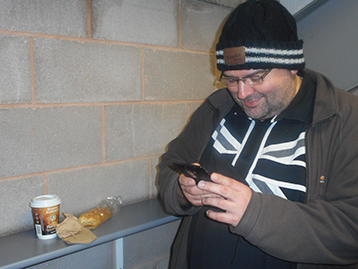 Meanwhile Harry Haddock was keen to discuss with Jez George (CUFC) associate, Tom, plans for next seasons over a cup of Green Tea. 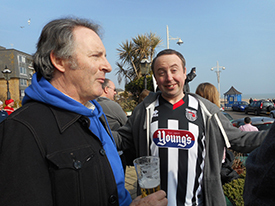 Ian Lowther of the Cleethorpes Chronical, The InnKeep & Lord Roy begin discussions about next season. A disastrous experiment by the authorities to play the game after the season end and play two games on the same day. In addition bars that ran out of liquid refreshment, eateries with no food and programmes unavailable till after the game! The first time in over 50 years the Innkeeper left before the end (actually in the 50th minute). 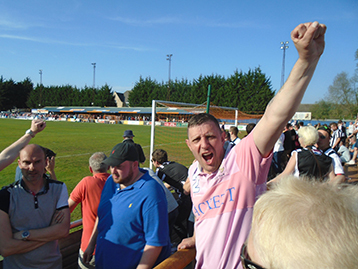 Congratulations to Halifax - their fans were particularly complimentary on the Histon Mariners campaign and the push for "real football" and the success of the Mighty Mariners. Final preceding’s naturally revolved around Mr Dicksons food intake. As they began, Dickson & Carmen that well known double act on their journey home recounted tails of awe, intrigue and food.